For enthusiasts. 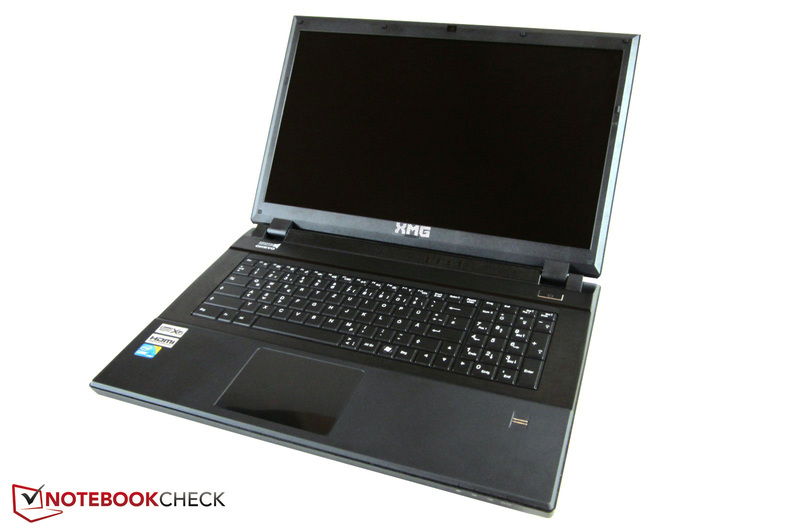 The Schenker XMG P722 PRO is definitely a notebook in a class of its own. 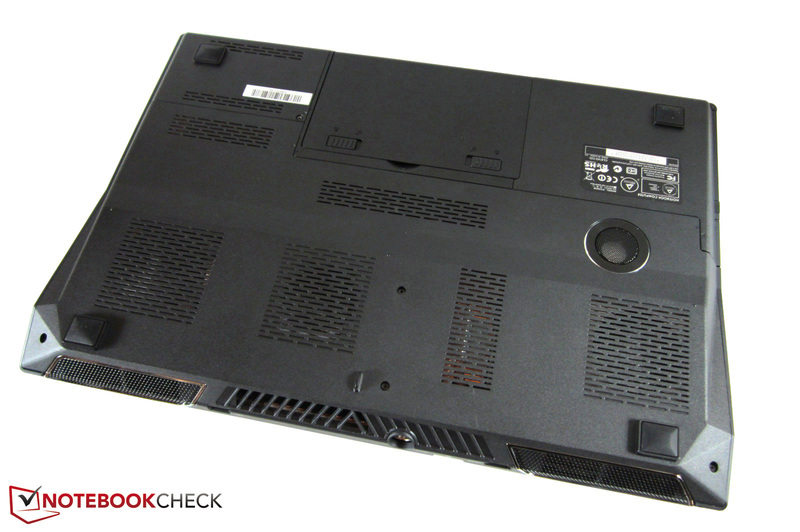 The massive 17-inch chassis comes, for a surcharge, with two GeForce GTX 680M cards. Demanding gamers will be happy about the three hard drive slots and a backlit keyboard. 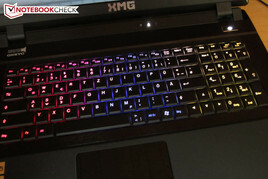 Does the high-end notebook come close to the Alienware M18x R2? 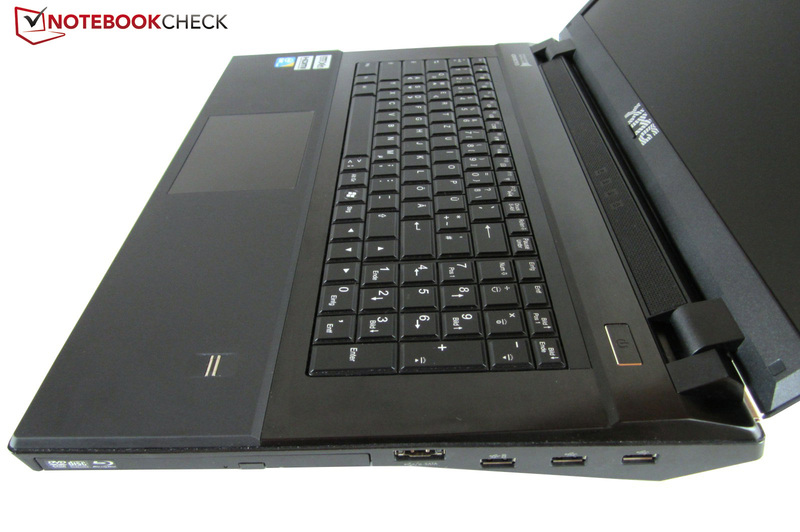 Note: The Clevo P370EM as reviewed is also available from Eurocom as the Eurocom Scorpius. North American readers can configure and order the Scorpius with similar internal specs here. Those who do not want to have a large desktop PC next to their desk, but at the same time expect the highest gaming performance, should look no further than Schenker Notebooks. The German gaming experts, who can be found at mysn.de, score points not only with the powerful components, but also with a rich configurator. 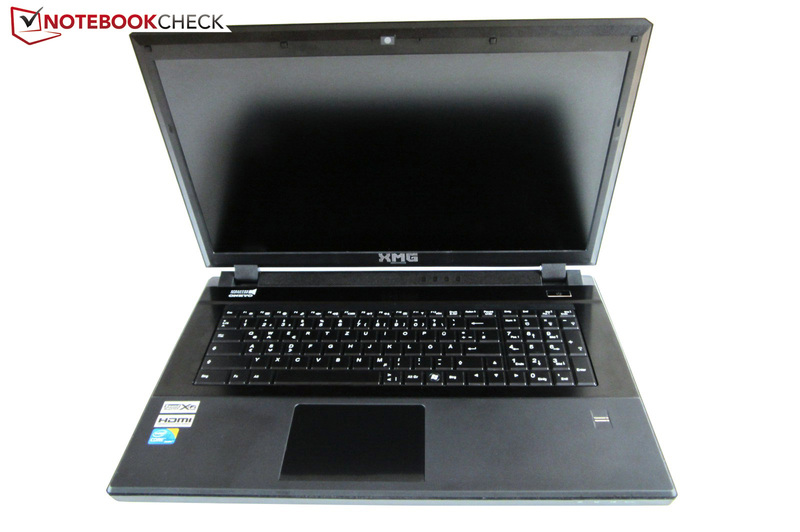 Large manufacturers such as Asus, MSI, and Toshiba often constrict the customer to specific hardware packages. 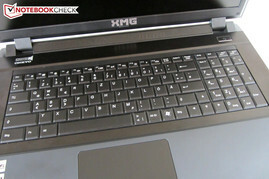 The Schenker XMG P722 (based on the Clevo P370EM barebone) is currently the most powerful 17-inch notebook of the company. The XMG P702 comes as number 2, and as number 3 comes the XMG A722. As an introduction, we start with the various configuration options. First is the Full HD display, which is offered with a matte or a glossy finish. In terms of graphics cards, available are: a single GeForce GTX 680M or an SLI version with two GTX 670M or GTX 680M GPUs. Note: The GTX 670M is based on Nvidia's old Fermi architecture, manufactured in 40 nm process (Kepler: 28 nm). We reckon that in the near future the Radeon HD 7970M (CF) will follow as well. Apart from some discontinued models (2000 series) the processor comes from Intel's modern Ivy Bridge generation (3000 series). Schenker offers only quad-core CPUs, which is not surprising in view of the GPU power. To avoid bottlenecks, in our test unit we have a 2.7-3.7 GHz Core i7-3820QM. For the average customer a Core i7-3610QM or a Core i7-3720QM should suffice, depending on the GPU choice. 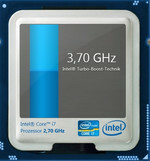 We would stay away from the extremely expensive Core i7-3920XM - the performance gain is not proportionate to the cost. 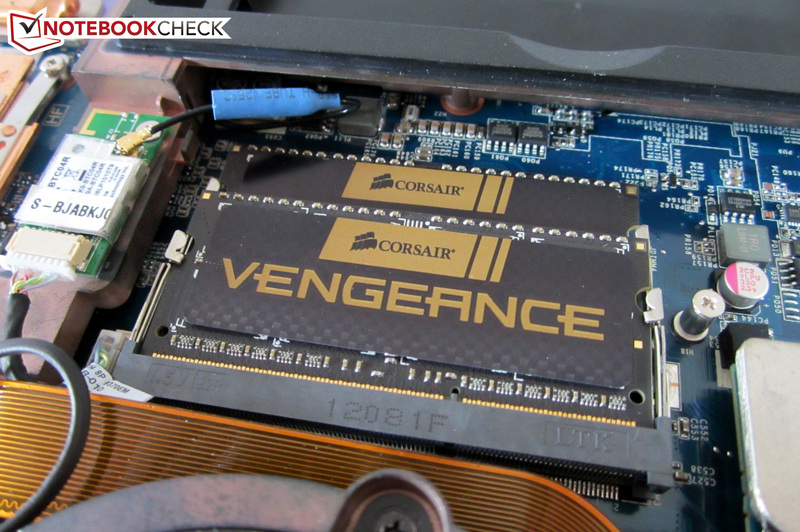 There are no surprises in terms of system memory (Corsair Vengeance). The four slots can take up to 32 GB DDR3 RAM. Tip: Four or eight GB is enough for most users. One of the biggest highlights is the possibility to install three (even four with an ODD caddy) hard drives. 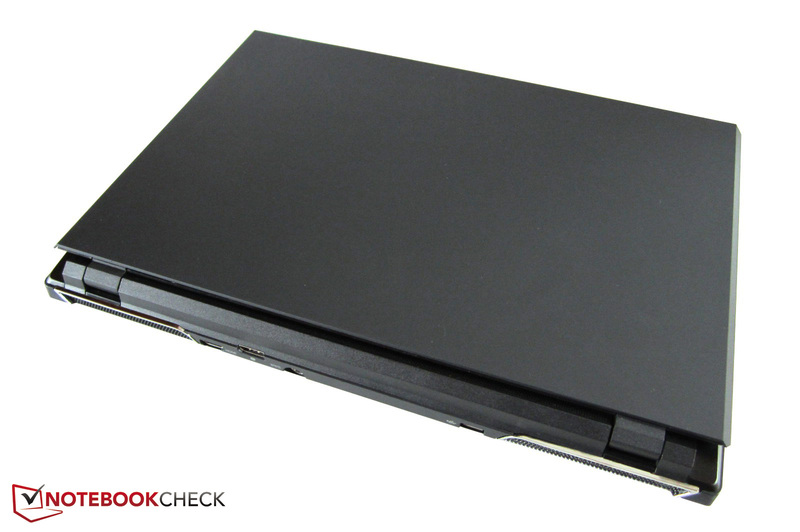 While the tiny mSATA slot can be filled with a 60-256 GB Solid State Drive by Crucial, OCZ or Samsung, Schenker offers for both 2.5-inch slots: HDDs (320-1000 GB), SSHs (500-750 GB) and SSDs (64-600 GB). 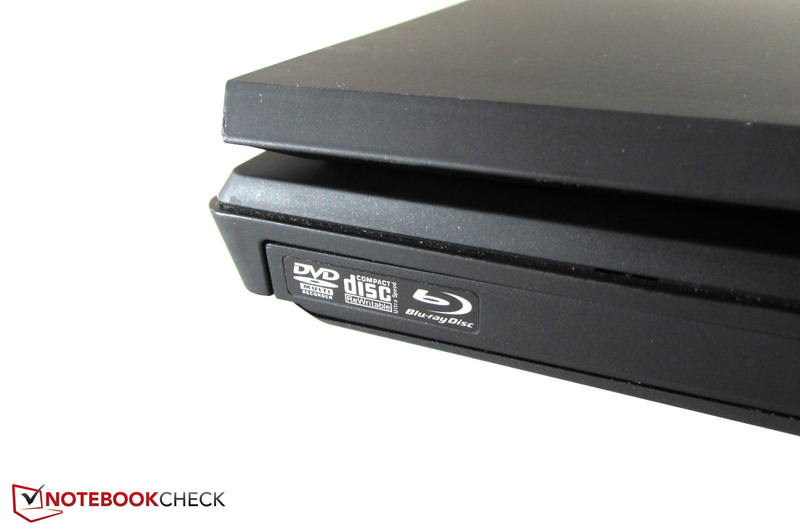 Significantly easier is the choice of optical drives: the standard DVD writer can be replaced with a Blu-ray player or a Blu-ray burner. The wireless module can be either Intel or Qualcomm Atheros. 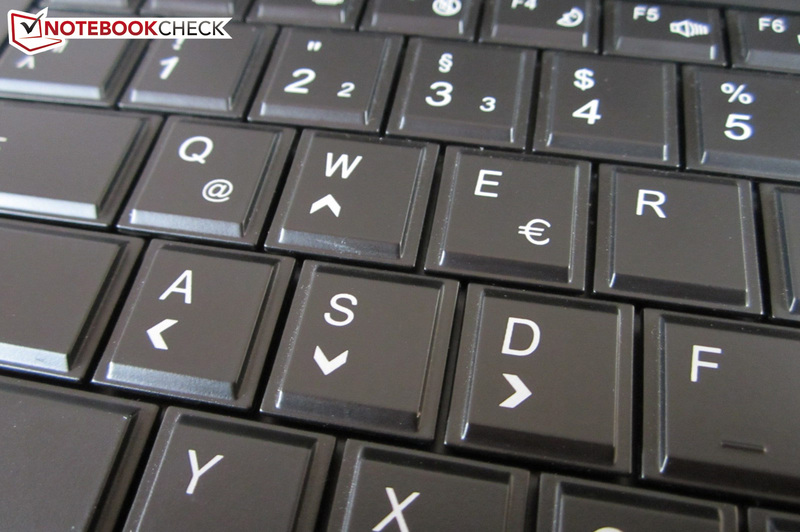 Schenker deserves praise also for the multilingual backlit keyboard. 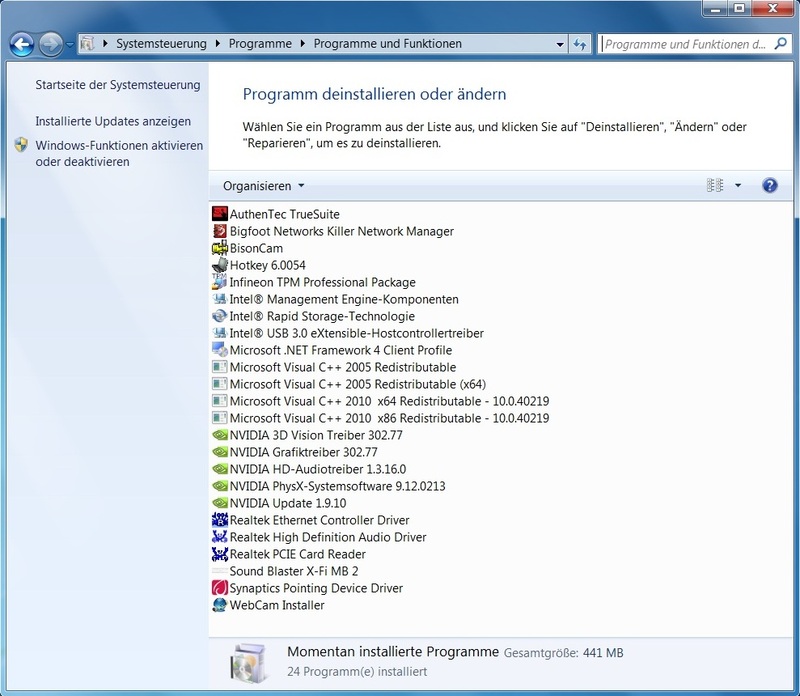 No operating system is available with the 1,499 Euro (~$1887) basic package - depending on the version, Windows 7 costs more than 100 Euro (~$125) extra. Those who go wild with the configurator can double or even triple the basic price. The Clevo P370EM barebone, weighing 4.3 kg (9.48 pounds) with two graphics cards, seems to be a mixture of the beloved P170EM barebone (single GPU, ~3.9 kg, 8.6 pounds) and the massive X7200 barebone (dual GPU, ~6.0 kg, 13.22 pounds). With a footprint of 419 x 293 mm (16.5 x 11.5 inches) the XMG P722 is somewhat bigger than its brother the XMG P702 (412 x 276 mm, 16.22 x 10.86 inches), but the height of the notebook is about 55 mm (2.16 inches). For comparison: the old XMG U700 was 419 x 286 x 73 mm (16.5 x 11.25 x 2.87 inches). The consumer is greeted by a successful mix of dark gray plastic surfaces and black aluminum (keyboard area). The palm rests and the lid have a rubber finish, which not every user will enjoy. The reason: The rubber coating is quite sensitive to wet or greasy fingers. After just a few hours, our test unit was covered in various stains. But the feel of it was quite comfortable. 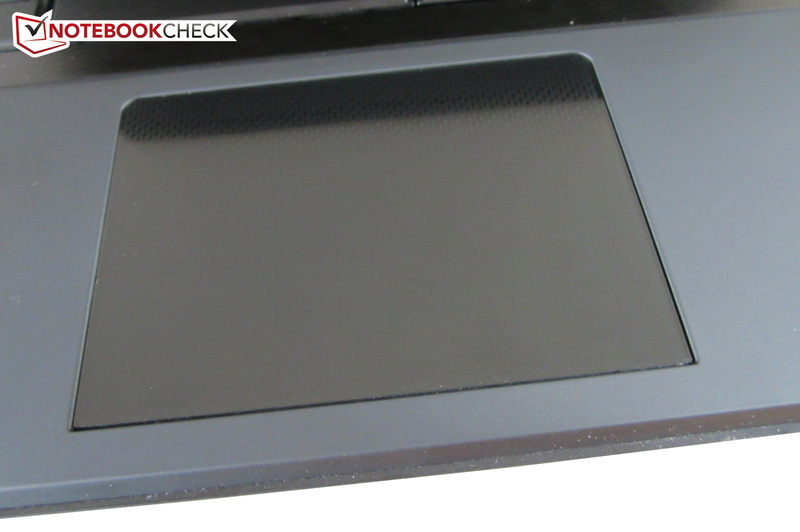 To a large extent there are no reflecting elements, with the touchpad being one of the few exceptions (a matte display frame is not always expected from Clevo). 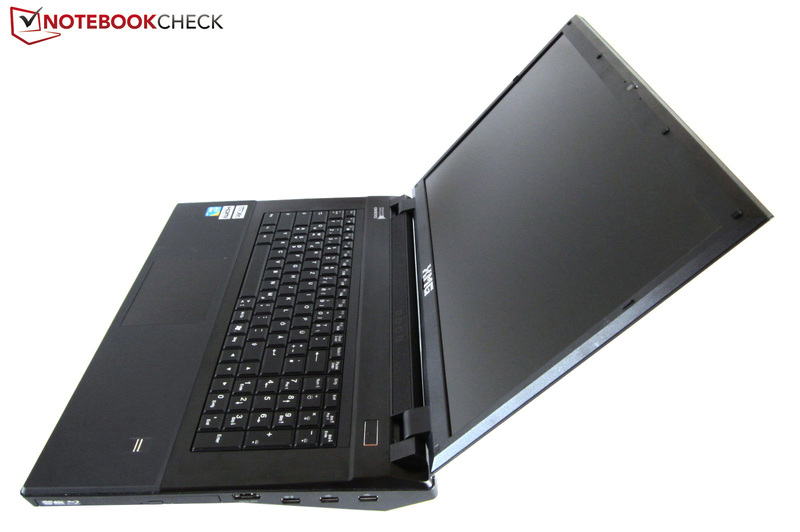 Although the design has become a bit more modern, the overall look of the 17-inch notebook is relatively plain. Another plus is the great workmanship: Even after a close inspection, one finds at most only minor discrepancies. The material quality is also very good, although you should not expect any new records. The Alienware M18x R2 is still qualitatively in a higher league. 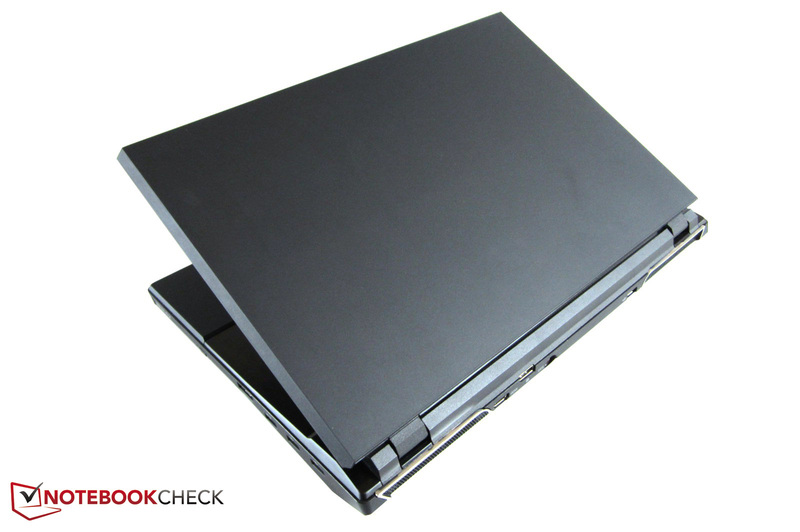 In terms of stability, the notebook leaves an overall positive impression. Even under high pressure, the chassis feels pretty stiff and only gives in minimally. The rigidity of the display lid on the other hand is average. Thanks to the high weight, the base unit does not move when opening the lid. Given the high price and enormous space available, Clevo easily could have installed more interfaces. A FireWire port is missing, as well as an ExpressCard slot and an analog video output (the M18x R2 is better equipped). Praiseworthy is the three USB 3.0 ports (1 x Charge), which are located on the right side next to the optical drive and the eSATA/USB 2.0 combo. The rear houses the AC jack, a DisplayPort, an HDMI output and a fourth USB 3.0 port. 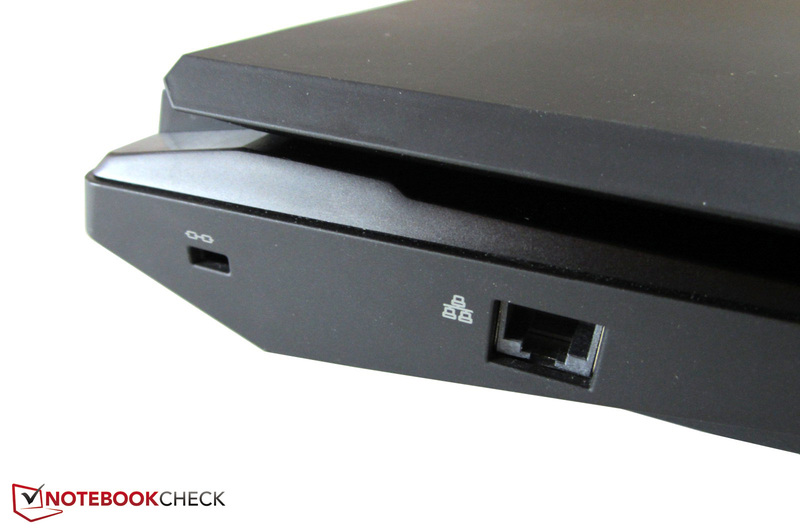 The left side features at the back a Kensington Lock, an RJ-45 Gigabit LAN port and a 9-in-1 card reader. The four audio jacks (incl. S/PDIF & 7.1 surround) are placed a bit too forward, in the author's opinion. It is a shame that the left side has no USB port. Otherwise the interface arrangement is a success throughout. 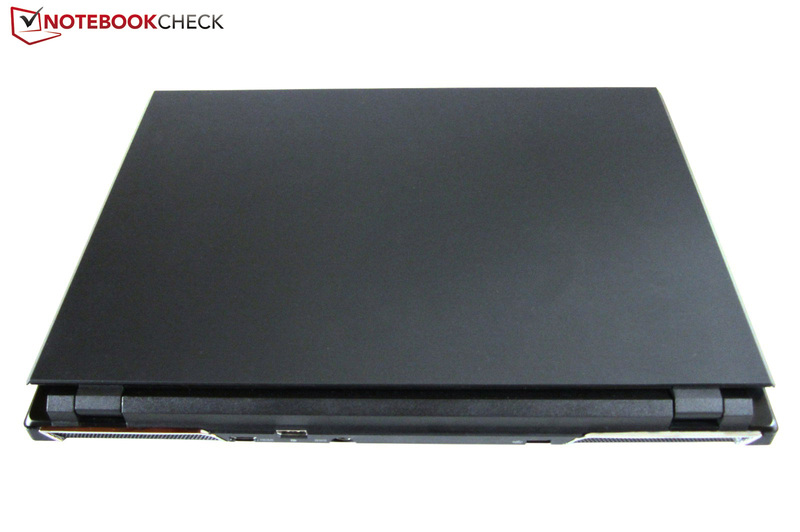 Our test unit came with the wireless module Bigfoot Killer Wireless-N 1102, a mini PCIe card in half height, which according to the manufacturer should deliver particularly high speeds. The two antennas (WLAN 802.11 a/b/g/n) receive and transmit data at up to 300 Mbit/s. The pre-installed Network Manager has tons of information and settings. 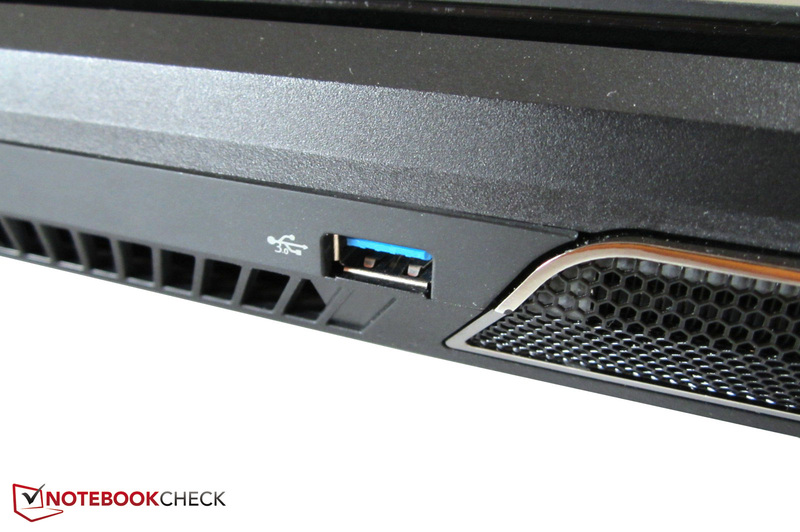 In order to hinder unauthorized access, Clevo has equipped the P370EM barebone with a fingerprint reader and a TPM module. The maintenance capabilities of the XMG P722 are exemplary. 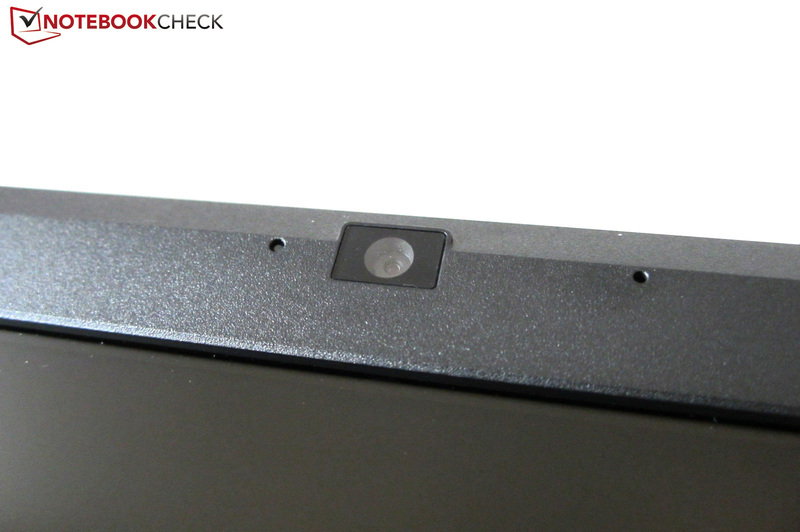 The 2.5-inch slot can be reached by removing just one screw and the bottom cover. The larger maintenance cover however, is secured with four screws. The CPU and the graphics cards have their own cooling systems, which facilitates any upgrades. While the video cards are placed next to their fans, the CPU is directly below one. Thanks to this design, there is enough space for the mSATA slot and two of the four RAM slots available. 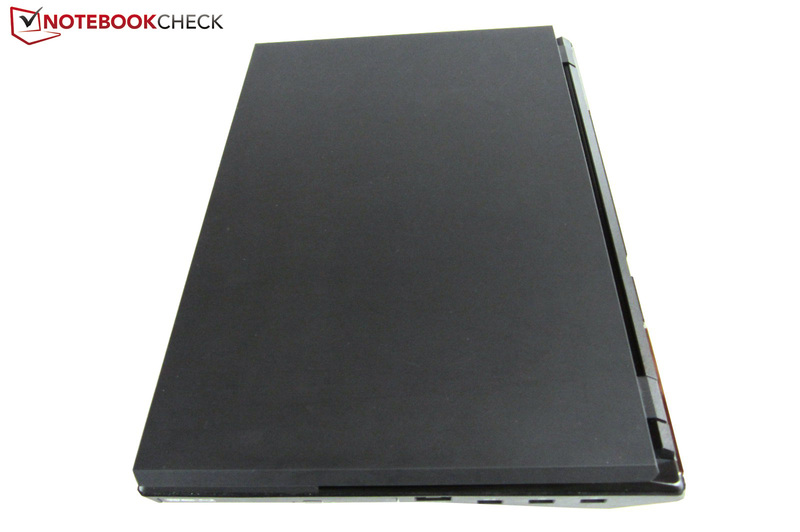 As we know from other notebooks, the rest of the system memory slots are waiting under the keyboard. Its disassembly is relatively simple (see pictures). Caution: The keyboard is wired twice. 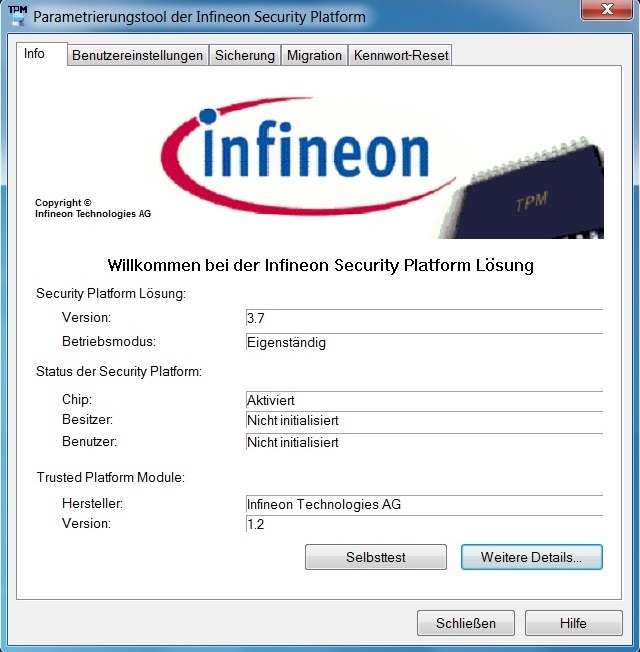 As expected, Schenker does not install unnecessary bloatware, whereby the system speed impresses right after delivery. Our test unit came with no extra goodies. 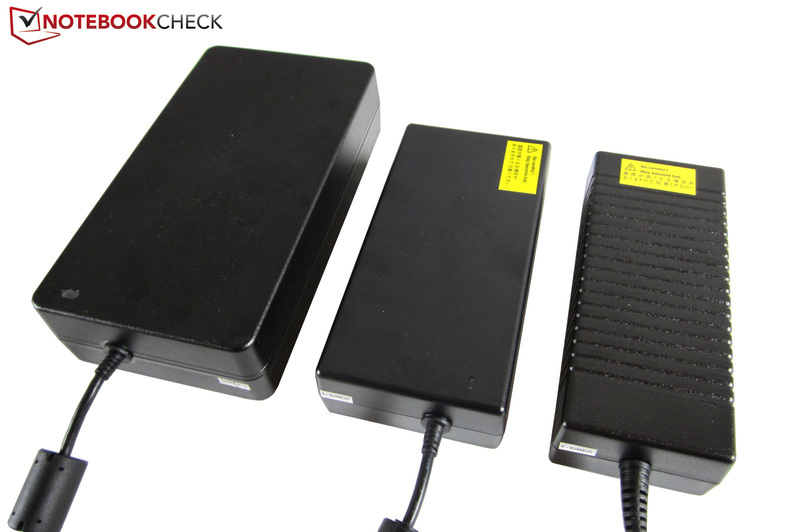 The 450 g (0.99 pounds), 8-cell battery is complemented by a large 210 x 115 x 50 mm (8.26 x 4.52 x 1.96 inch) and heavy (almost 1.5 kg/3.5 pound) 300 W power supply. Only a few devices require similarly high power. The end user will also receive a recovery DVD, a manual, and a driver DVD. The basic two-year warranty can be extended up to 36 or 48 months. The Pickup-&-Return service is limited to the area of Germany (Bring-In abroad). The keyboard stands out with its 3-zone lighting, which does not fall behind the rivals from Alienware. You can customize the colors through the included tool. Illumination can be adjusted through the dedicated number keypad. The keyboard also easily covers the rest of the aspects. The large 17 x 17 mm (0.67 inch) keys (usable surface: 13 x 13 mm, 0.51 inches) are noticed for a crisp typing experience and a proper sound. Only the space bar is louder than average. The unusual German layout does take some getting used to (single-line Enter, shifted ><|-buttons). A criticism of the keyboard is the high and in practice somewhat annoying pressure point. 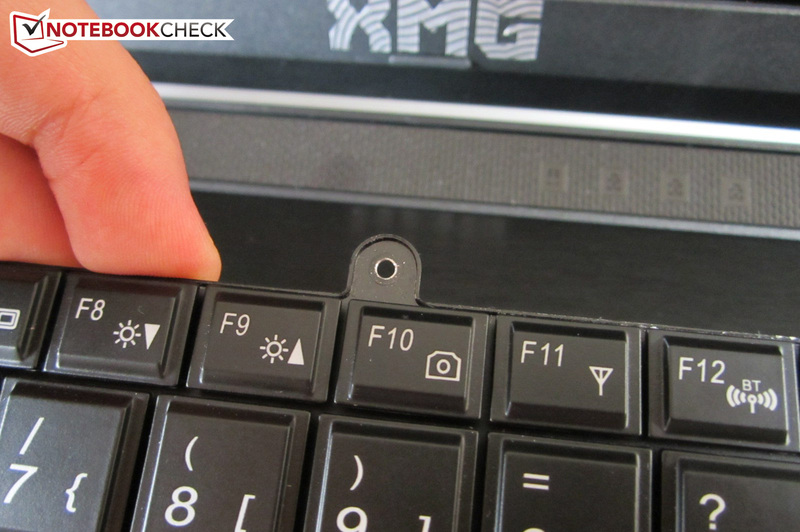 The old chiclet model, which can be found in the XMG A502, requires less force and is more suitable for gaming. Speaking of games: As with the XMG P702 we had to fight the problem that sometimes, movements would abruptly stop or would not execute at all (especially dangerous in multiplayer titles). 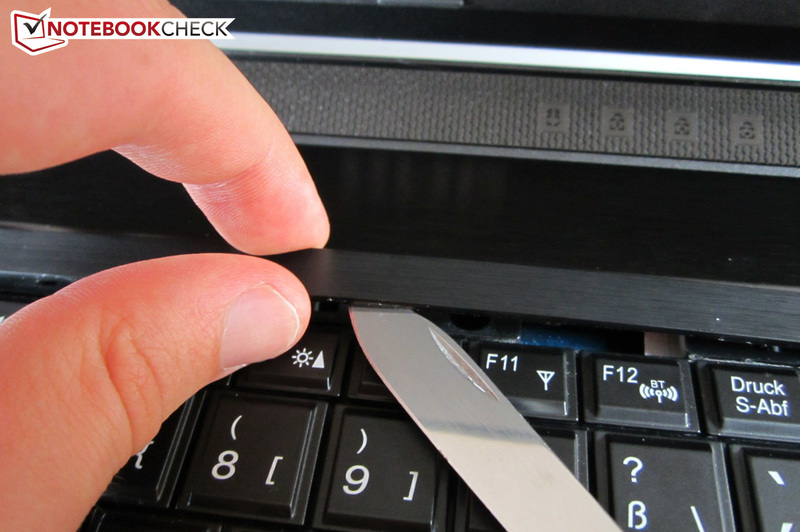 Since the issue occurs only with one key pressed, we can exclude ghosting as the cause. The high pressure point is also not to blame. According to our information, fortunately not all keyboards are affected (eventually you would need to send the device back for an exchange). The touchpad is generally not impressive. The glossy surface seems stylish at first, but after a short period of time it teems with fingerprints and general dirt, particularly since the gliding is moderate. The good dimensions (117 x 77 mm, 4.6 x 3.03 inches), the decent precision and the useful multi-touch gestures (zoom, scroll, rotate) can only partially make up for this drawback. Super: The touchpad does not need to be deactivated while gaming, as it is not centrally aligned in front of the space bar. 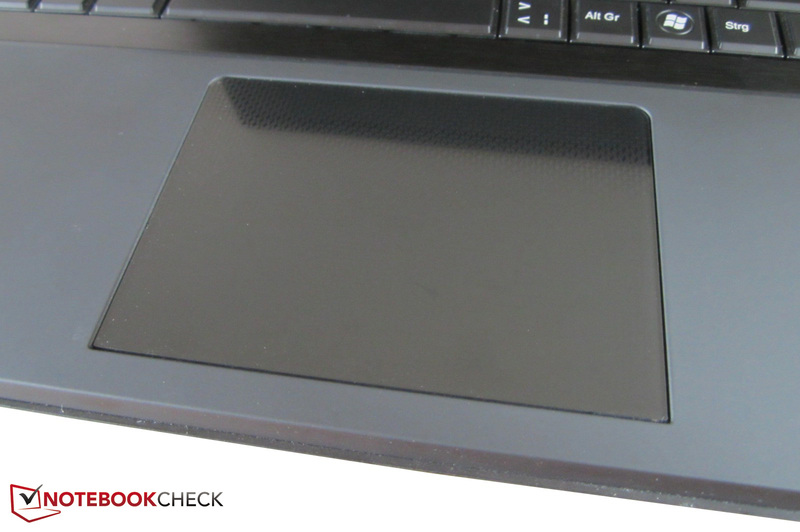 Less good: The mouse buttons are integrated directly in the touchpad. 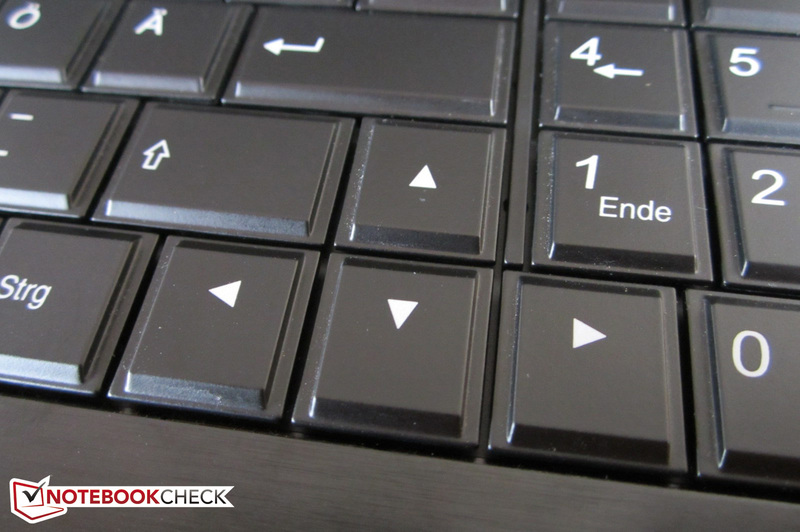 The buttons respond only in the predetermined location, but the click sound can be heard everywhere on the touchpad (even at the top). We would have preferred separate mouse buttons and a smooth surface. 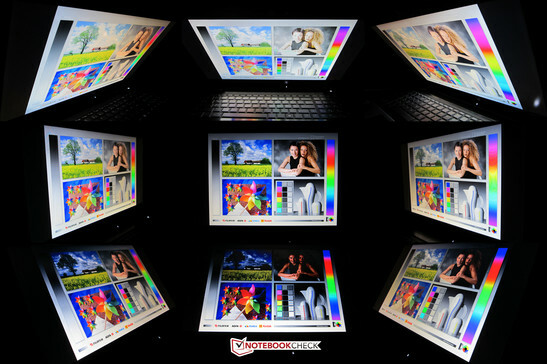 As we mentioned above, the 17.3-inch panel is available in either a glossy or a non-glare version. 1920x1080 pixels guarantee not only a sharp picture, but also a proper working space. Two adjacent windows, for example a word processor and a web browser, are not a problem. Thanks to the large diagonal (43.9 cm, 17.28 inches) and the 16:9 aspect ratio, games and movies are adequately displayed. Do the inner results satisfy as well? We were able to closely examine the non-glare Full HD display by AU Optronics (B173HW01 V5) in the Medion Erazer X7817. 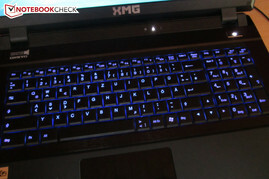 Except for the poor illumination (~80%) all the characteristics are above the notebook standard. 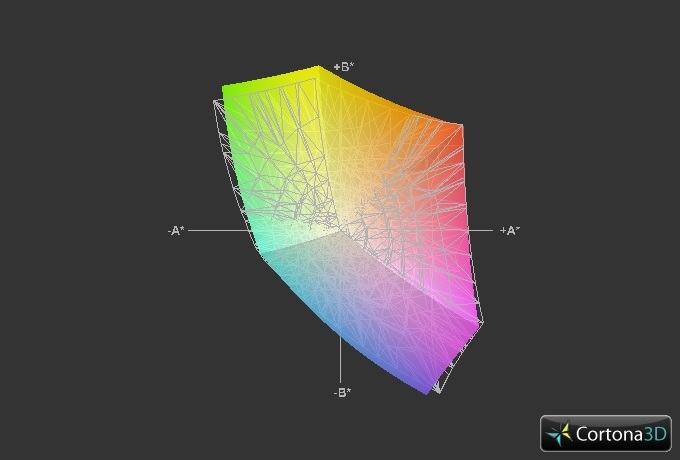 A luminance of almost 260 cd/m² is enough for bright interiors. 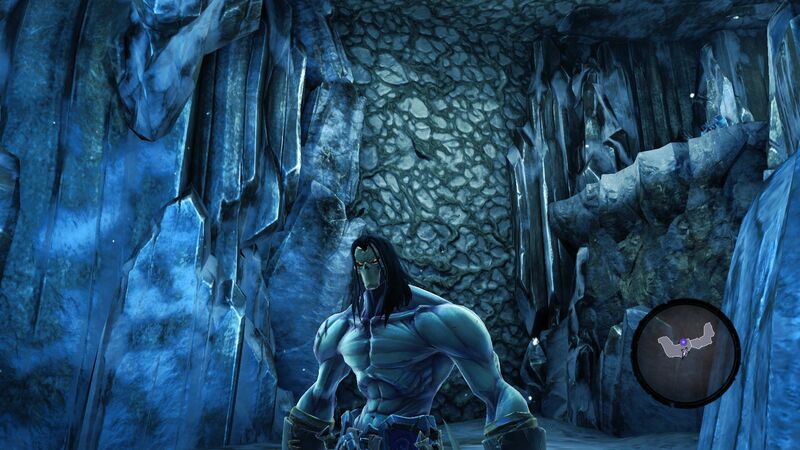 The black level can also be described as good. 0.35 cd/m² provides for a usable picture quality in dark backgrounds (Photos, Videos, Games etc.). With high black level you would sometimes see grayish content. 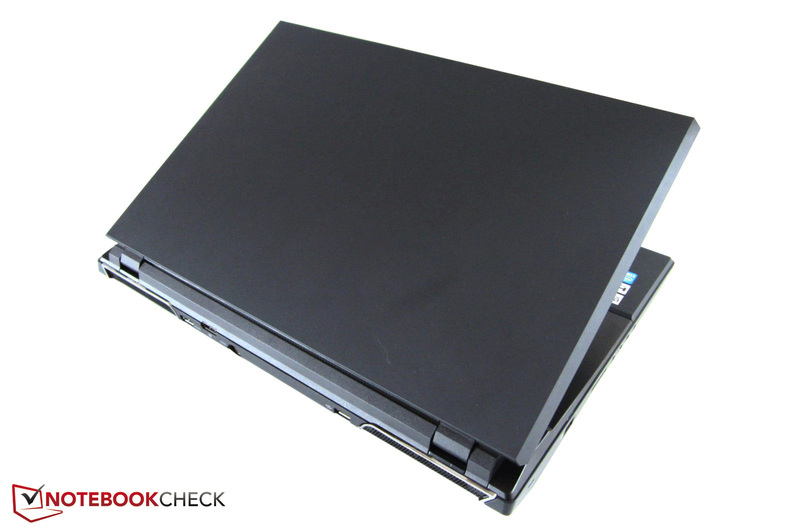 For comparison: Most cheap notebooks reach above 1.0 cd/m². In combination with the great contrast ratio (~730:1) the display leaves us with a high-quality overall impression. The color reproduction is also accurate - the sRGB space is almost completely covered. Nonetheless the picture is a bit stronger on some non-glare panels. 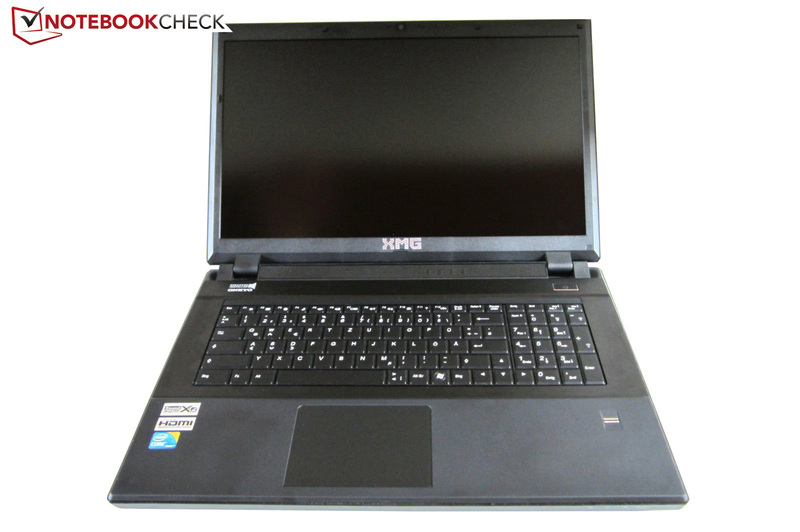 The Chi Mei N173HGE-L11 integrated in the XMG P702 can reach an even higher score. Our outdoor photos were taken on a pretty cloudy day. When the sun is not shining directly into the display, the screen is perfectly visible. On brighter days in direct sunlight the device is still possible to use, but for an optimal experience the brightness would have to be more than 300 cd/m². 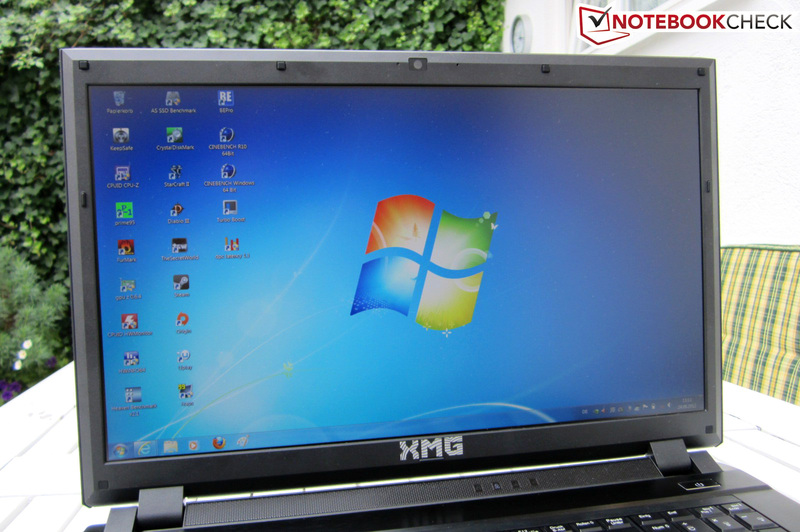 Because of the high weight of the notebook, most users would prefer to remain inside anyway. The viewing angle stability is that of a good TN panel. While one can sit in different horizontal positions without any problems, vertically the monitor should point as much as possible towards the viewer. Even slight deviations lead to distortions. It is not impossible that Clevo might change the display without notice (therefore the values can vary). The mobile high-end class has been dominated by Intel's Core i7 processors for quite some time. 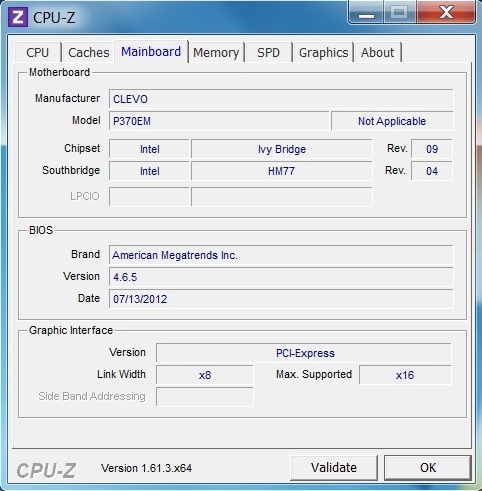 The current Ivy Bridge (22 nm) offers, as did its predecessor Sandy Bridge (32 nm), high performance and lots of features. The potent quad-core models 3610QM, 3720QM and 3820QM have a TDP of 45 W and place themselves between the frugal 3612QM (35 W TPD) and the luxurious 3920XM (55 W TPD). 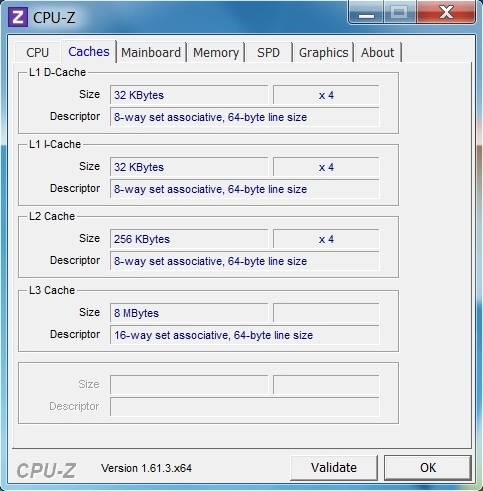 Six or eight MB L3 Cache (depending on the model) is also respectable. Thanks to the hyperthreading technology, the quad-cores can process up to eight threads simultaneously. 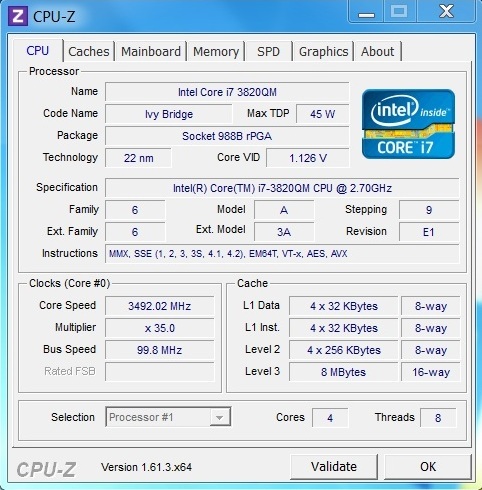 The Turbo Boost function allows for a dynamic overclocking. 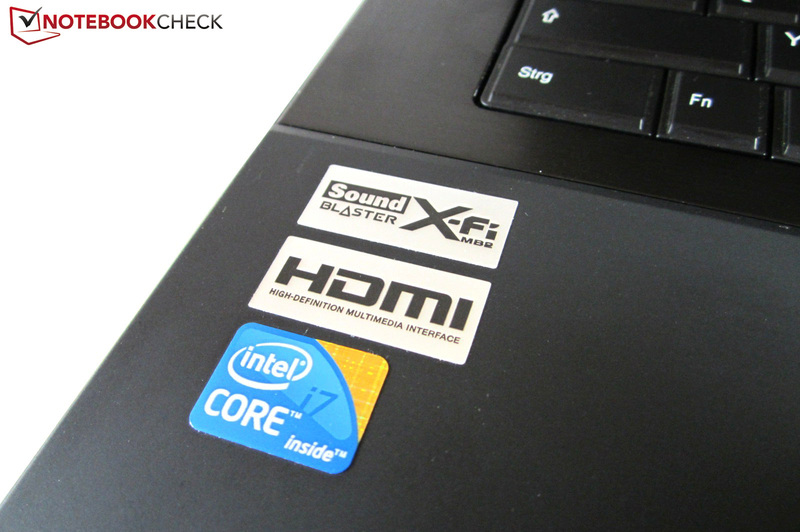 Schenker has equipped our test unit with the 2.7-3.7 GHz Core i7-3820QM, which costs about 300 Euro (~$377) in the online configurator and provides more than enough power for the SLI combo (the same goes for the cheaper Core i7-3720QM). Purely from a price-performance point of view the Core i7-3610QM is currently most attractive. Since the notebook lacks graphics switching, the integrated DirectX 11 chip HD Graphics 4000 cannot be used to save power. Under load, the processor clock frequency is massively increased above the standard value. 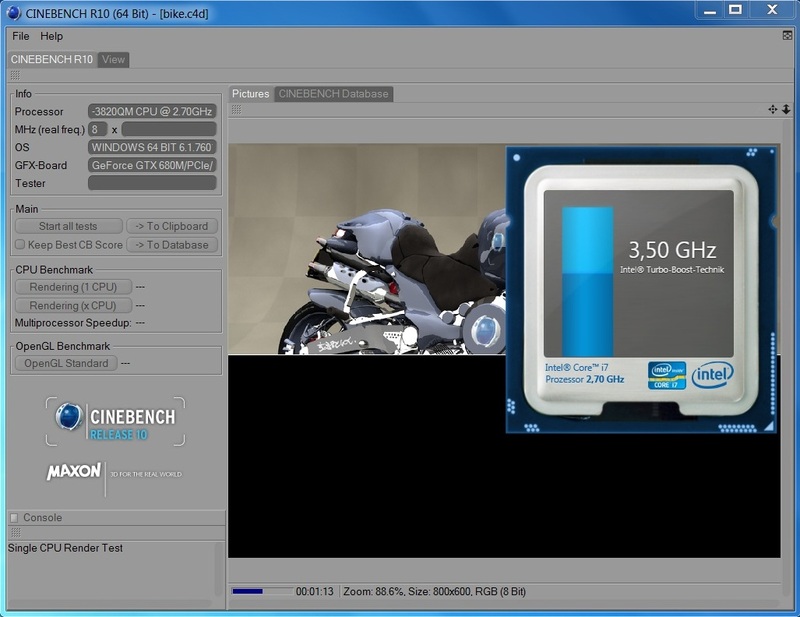 In Cinebench R10 our Core i7-3820QM worked at the excellent 3.5-3.6 GHz. 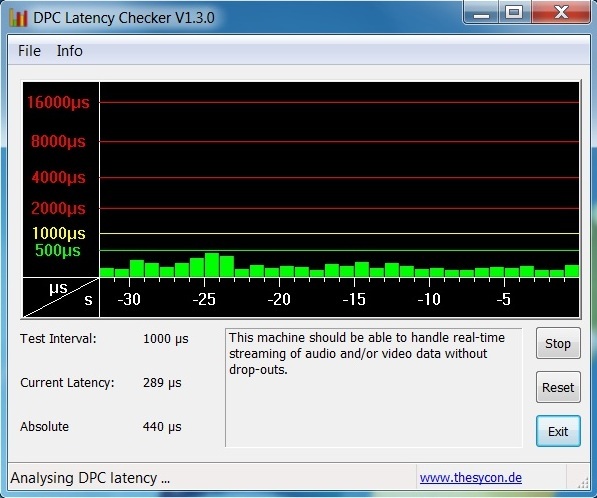 Even with GPU load, the 3 GHz mark was constantly exceeded (see pictures). The weaker models should benefit considerably from the Turbo Boost function. 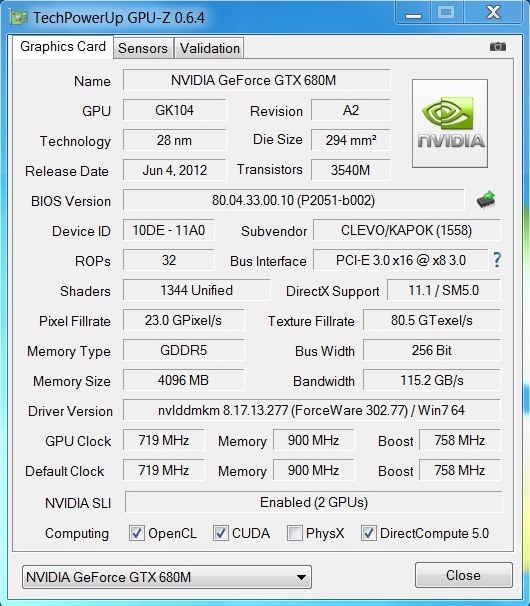 Unlike other Kepler GPUs (for example the GT 650M or the GTX 660M) the GTX 680M must do without automatic overclocking. 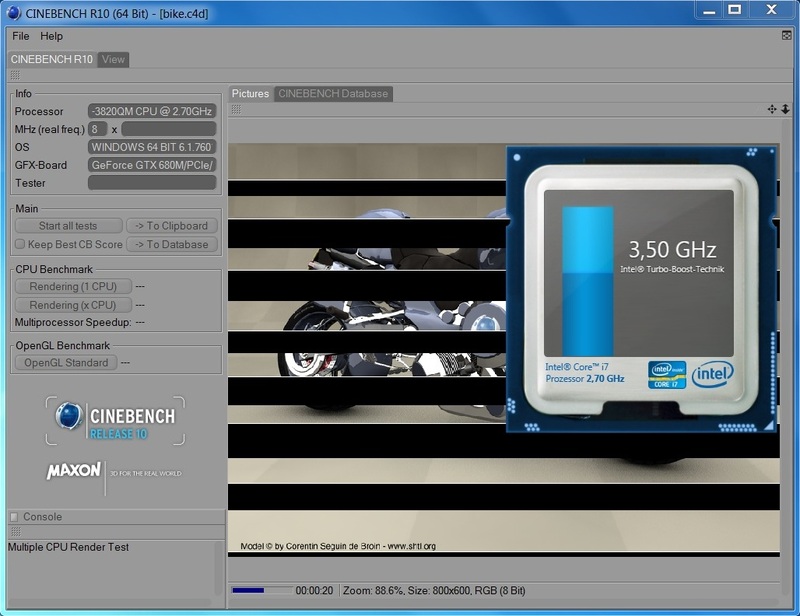 The multi-core optimized Cinebench R11.5 quickly separates the wheat from the chaff. 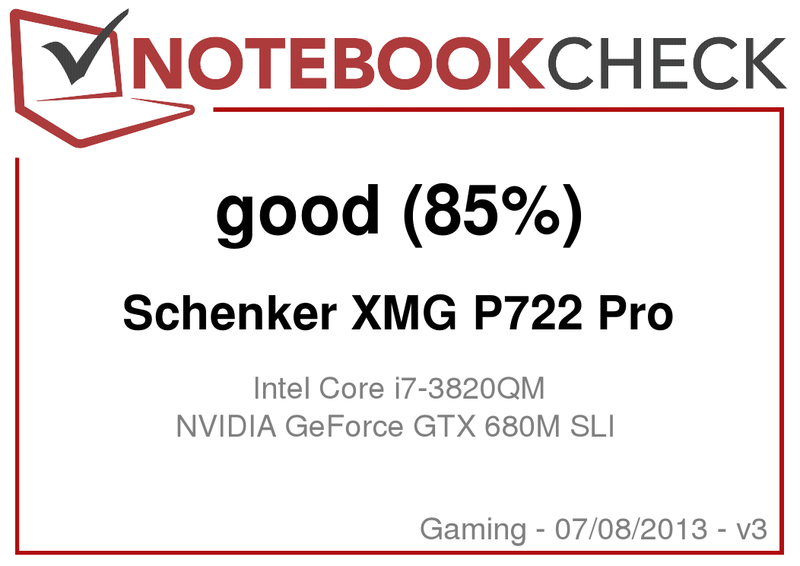 With 6.89 points, the Core i7-3820QM is 4% faster than the Core i7-3720QM (6.6 points @ Schenker XMG P702) and 10% quicker than the Core i7-3610QM (6.27 points @ Schenker XMG A522). 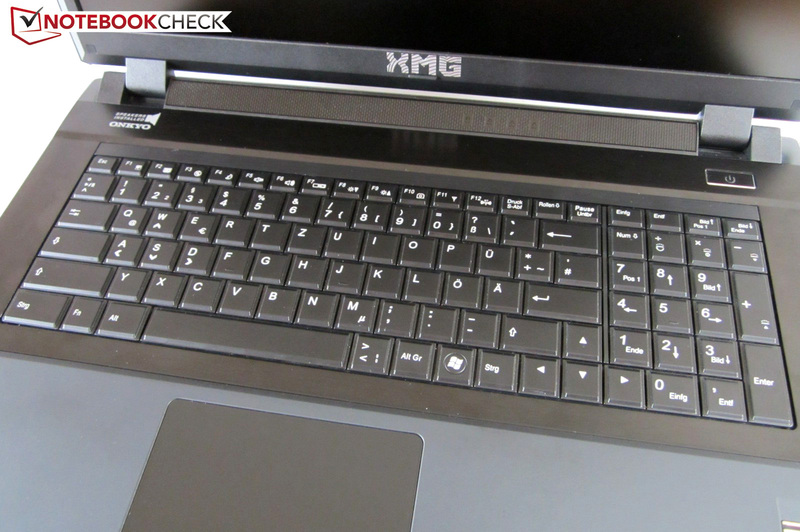 The 35 W Core i7-3612QM is beaten by 23% (5.62 points @ Schenker XMG A102). Intel's top model, which costs 700 Euro (~$880), the Core i7-3920XM reaches almost 7.2 points. Since we have already tested the Single GTX 680M in detail and the GTX 670M is just a higher clocked GTX 570M, we ordered the XMG P722 with a Dual GTX 680M. While AMD's dual GPU solution is called CrossFire, Nvidia uses the term SLI. 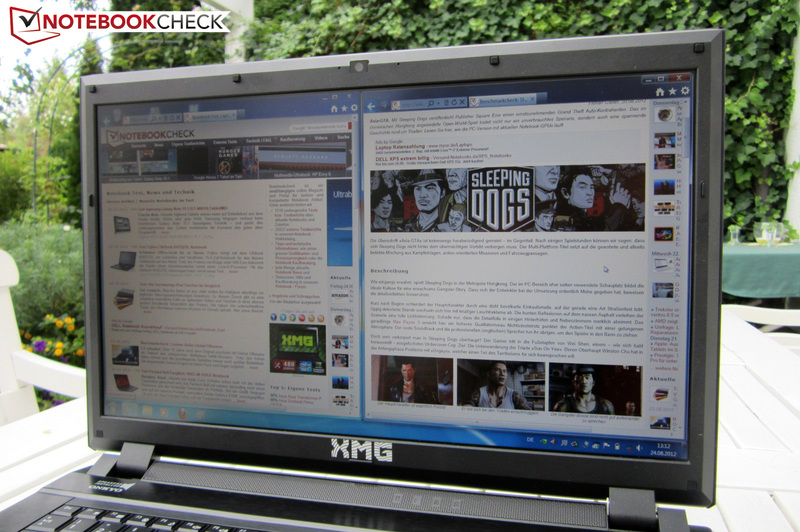 Together the Radeon HD 7970M and the GeForce GTX 680M are the current notebook reference. The DirectX 11.1 capable Kepler model is manufactured using the 28nm process (Fermi: 40 nm) and has 4096 MB of GDDR5 video memory, which is tied to a 256-bit wide bus. The clock frequencies are 720 MHz (core) and 1800 MHz (memory). Otherwise the 100 W GPU supports various technologies. For the gamers most interesting are the PhysX (GPU based physics acceleration) and the 3D Vision (stereoscopic 3D playback on a 120 Hz monitor). 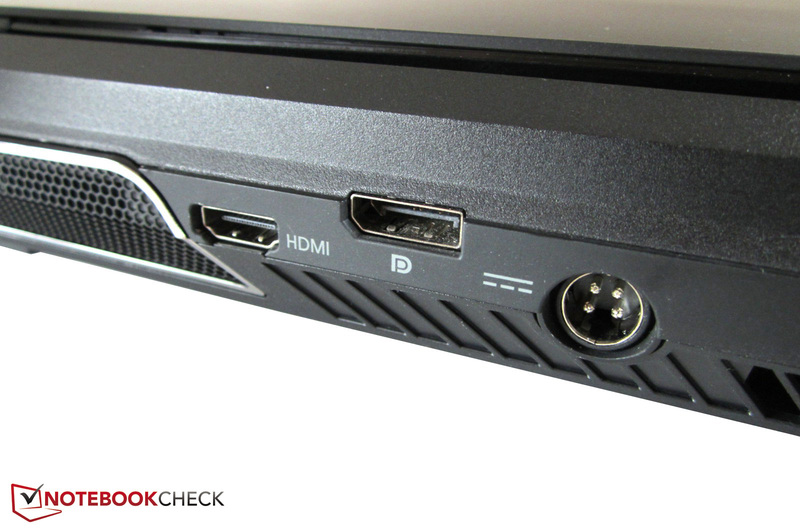 Via the HDMI a high resolution picture and sound can be transmitted to an external device. The SLI combo is spared from the micro stuttering (subjective, due to varying image distances) thanks to the enormous raw power. Only in extremely demanding games, which run at less than 40 fps, does the image rendering feel worse than that of a single GPU. 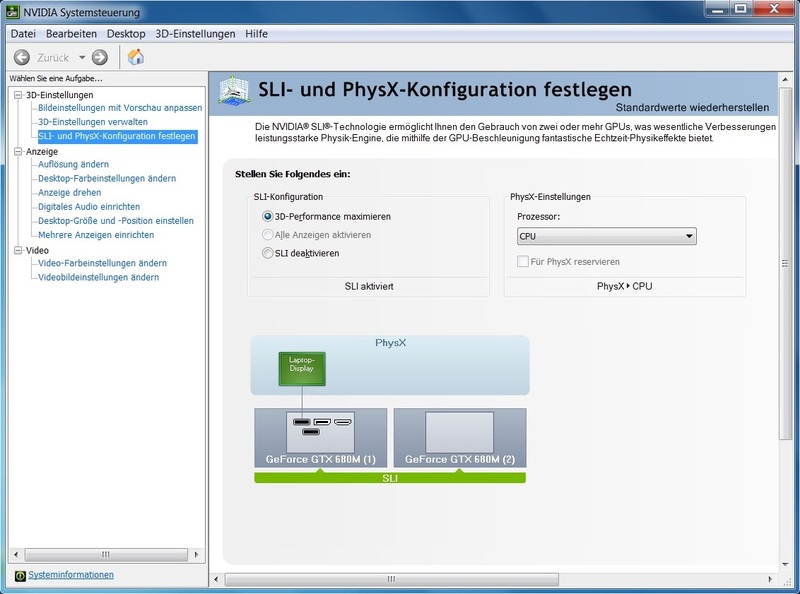 Tip: in order to get the maximum out the SLI combination, one should update the driver every couple of weeks (on the Schenker, Clevo or Nvidia homepage). The system must be restarted if SLI is deactivated. Modern DirectX 11 programs elicit just a lazy smile from both graphics cards. For example in the Unigine Heaven Benchmark the XMG P722 scored 131.8 fps at 1280x1024 pixels and the normal tessellation setting, which is 78% better than the result of a single GTX 680M (74.2 fps @ Schenker XMG P702). The Radeon HD 7970M benefits even more from a second GPU: instead of 80.1 fps (Alienware M17x R4) we measured almost 90% better results at 151.3 fps (Alienware M18x R2). 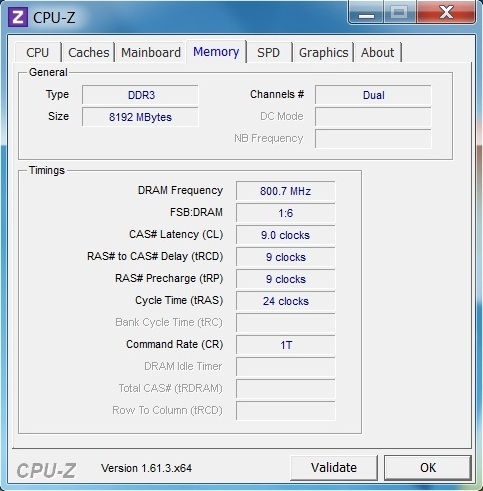 It should be noted that the Radeon HD 7970M CF was tested with a Core i7-3920XM, clocked at 4 GHz. 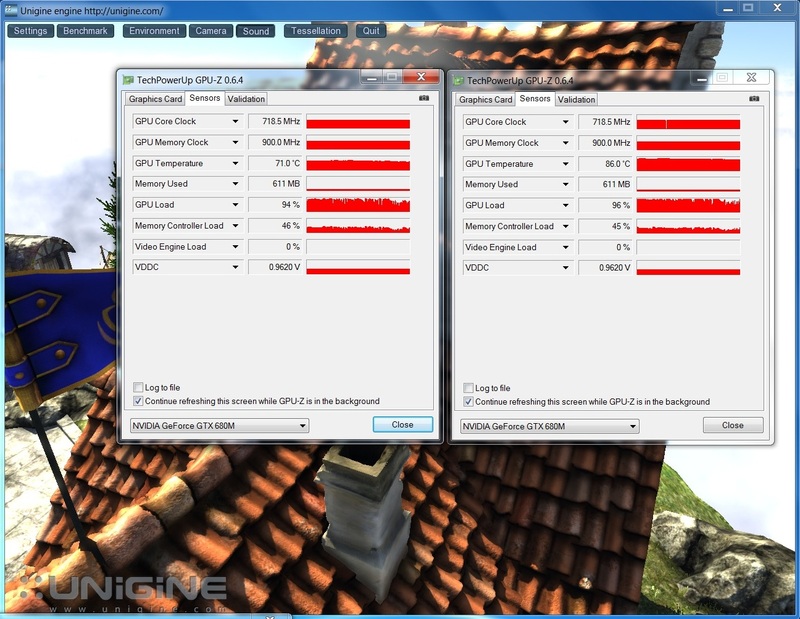 The 3DMark 11 proved that the GeForce GTX 680M SLI has great performance. 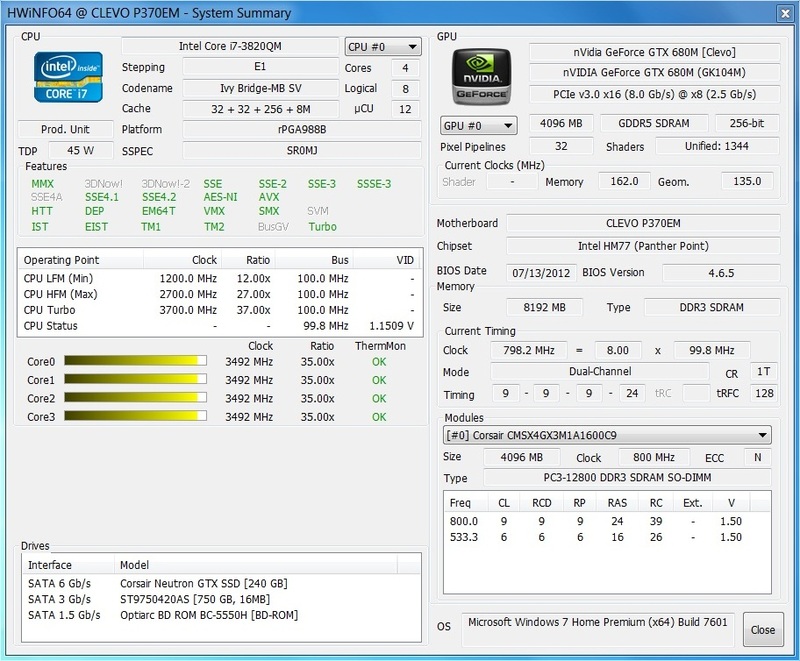 A GPU score of 10,983 points is close to the dual HD 7970M (11,109 points). 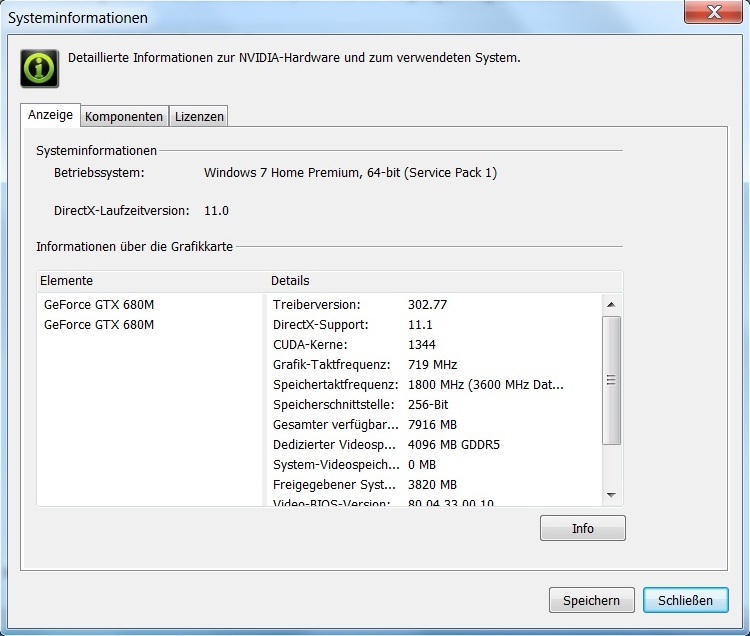 A single GTX 680M manages about 6000 points and a single HD 7970M - about 5500 points. The 240 GB Corsair Neutron GTX was especially exciting for us. The US company challenges the whole SATA III competition with this brand new solid state drive. 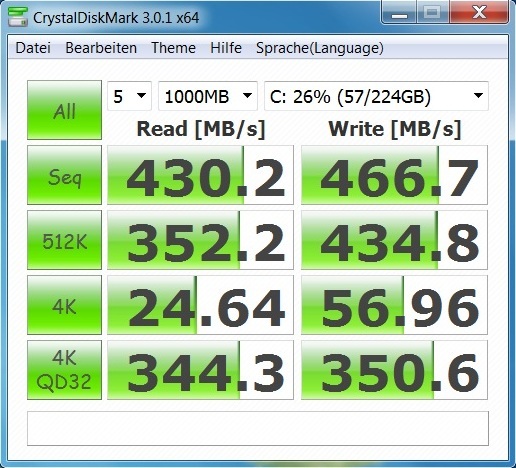 The integrated LAMD LM87800 controller does an outstanding job, which is obvious from a look at the AS SSD Benchmark. 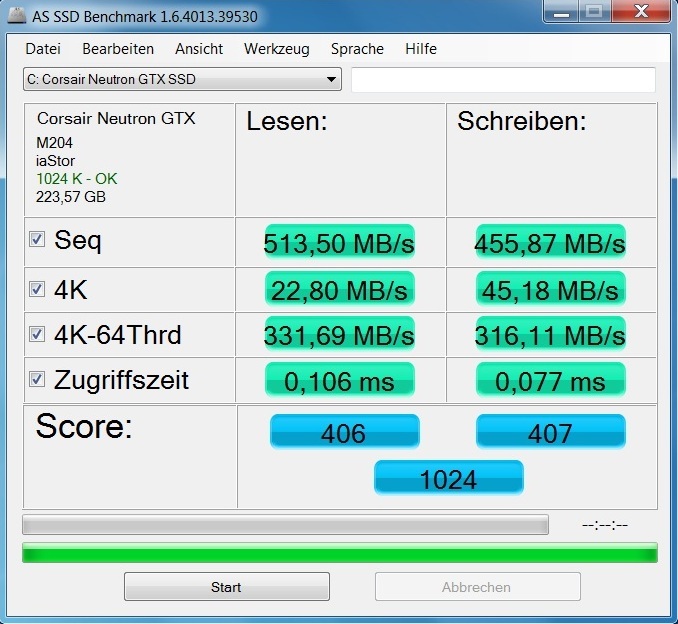 Thanks to the sequential read rate of 514 MB/s and a sequential write rate of 456 MB/s the Neutron GTX overtakes not only the beloved Crucial RealSSD M4 (479 & 185 MB/s) and the Intel SSD 520 (496 & 288 MB/s), but also the successful Samsung SSD 830 (499 & 401 MB/s). 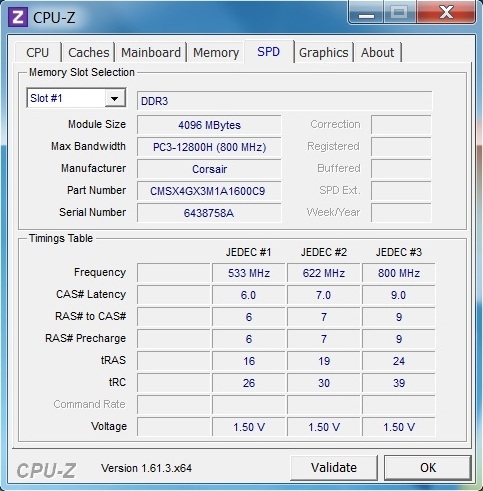 Only the OCZ Vertex 4 (503 & 459 MB/s) is fit to hold a candle to the Corsair model in the write speeds. Since even small data is transferred extremely quickly (a new record in 4K-64 write test) and the access times are remarkably low (0.08 - 0.1 ms), we are talking about completely successful performance. However, we cannot predict how the Neutron GTX does in terms of longevity. 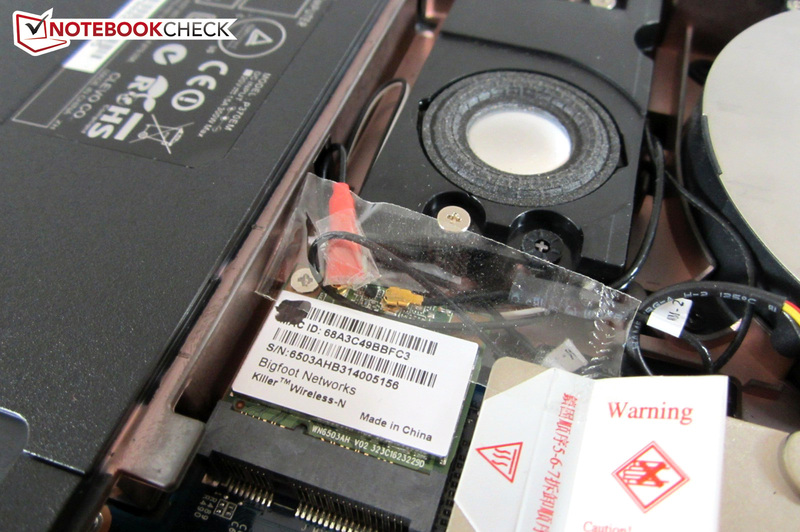 You should always take into account the failure rates when buying an SSD. Some models do relatively poor here (as far as you believe the customer reviews). 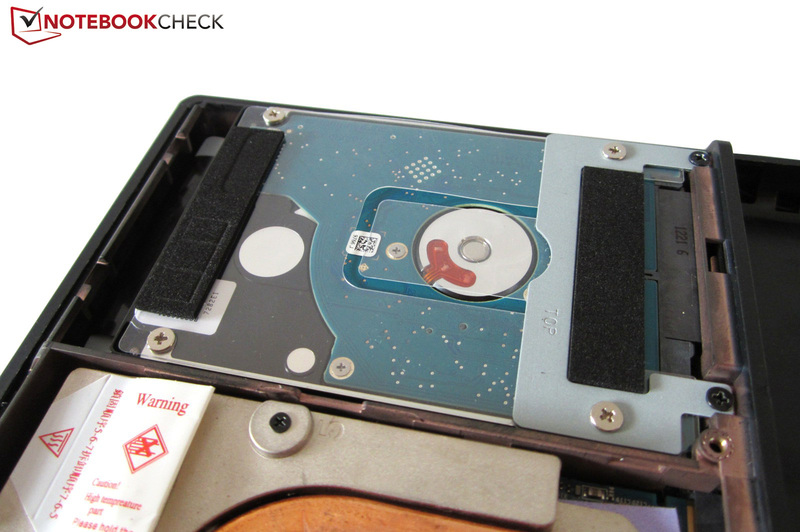 In the secondary hard drive slot (2 x 9.5 mm possible) we find a 750 GB HDD. The Seagate Momentus ST9750420AS works at 7,200 RPM, which guarantees a relatively good performance. 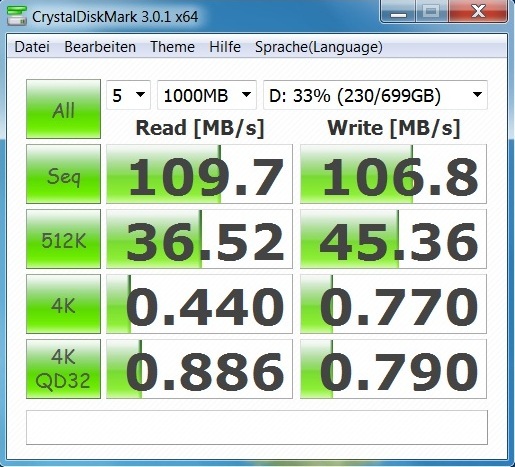 The CrystalDiskMark showed the SATA II model working at almost 110 MB/s – an above average HDD performance. 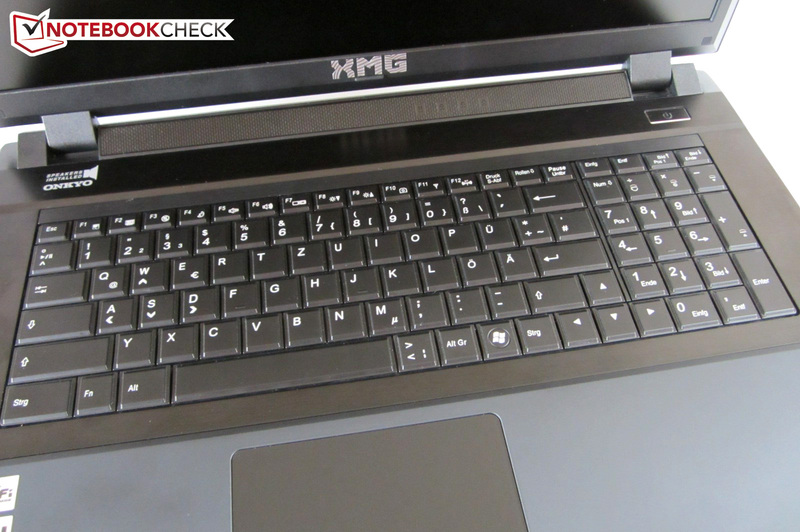 The Schenker XMG P722 PRO is the fastest desktop replacement we have ever put under the microscope. This verdict is also based on the system benchmarks. 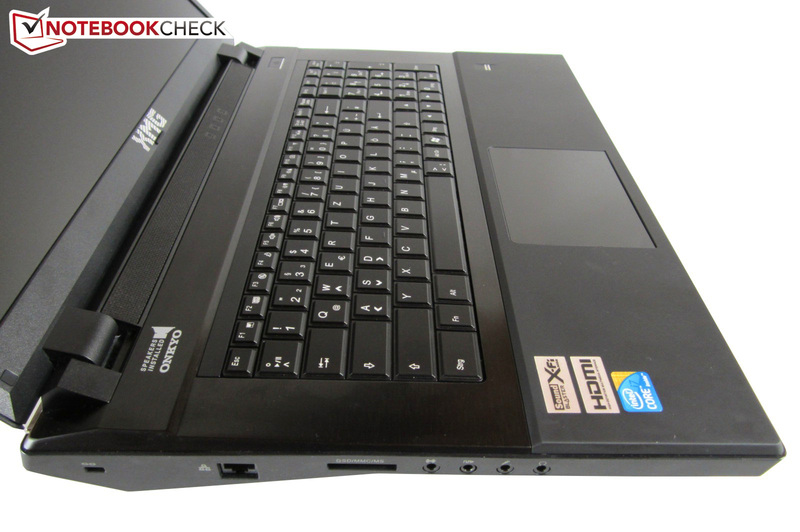 With 22,177 points the 17-inch notebook is right behind the Alienware M18x R2, which scored 22,421 in the PCMark Vantage (HD 7970M CF, i7-3920XM, 512 GB SSD). In PCMark 7 the high-end notebook has an equally impressive performance, whereby the M18x R2 again is marginally better (5130 vs. 5323 points). As can be seen in the comparison table under the review, the SLI performance depends very much on the game itself. Extreme case A: The frame rate is doubled in comparison to single card. This occurred in about half of the 22 games we tested. Extreme case B: The performance is worse than with a single GPU. If a title does not use the second GPU, the corresponding SLI profile is probably missing from the driver. Overall the dual GPU advantage varies extremely. If you consider our ultra settings (1920 x1080 pixels, maximum details, multiple anti-aliasing) the second GTX 680M brings about 50% more power. AMDs fiercest rival, the Radeon HD 7970M CF, is at a comparable level, but falls 6% behind in total sum. The high noise emissions cost the XMG P722 a couple of points. Even in idle state, the three fans are audible. At a distance of 15 cm (5.9 inches), our measuring device showed between 35 and 38 dB(A). 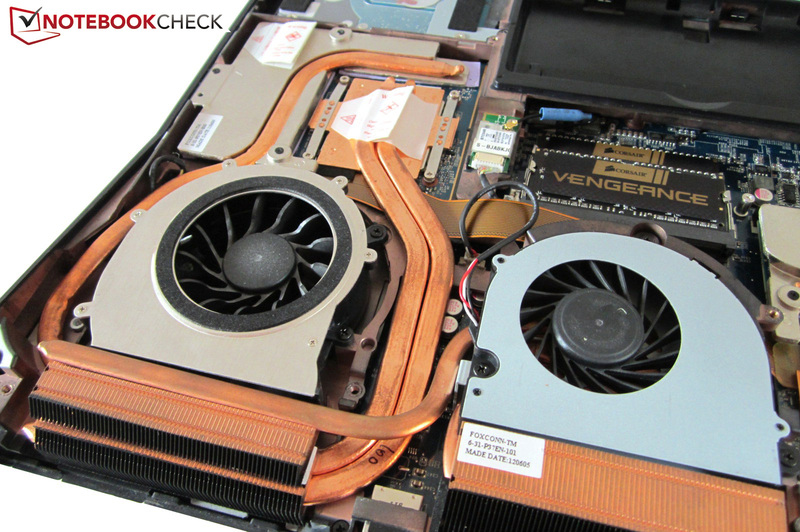 The rival Alienware M18x R2 remained quieter at undemanding tasks (~33-34 dB(A) at idle). Under load the 17-inch notebook is clearly audible. With almost 44 dB(A), the fans were a bit quieter during 3DMark 06 than in the Alienware notebook (~42 dB(A)). For some users the noise levels would already be slightly disturbing. Those who usually play with headphones and/or play sound intensive genres (FPS, racing, etc.) should be able to handle the noise. Under unnatural full load the XMG P722 is quite uncomfortable: Our stress test registered more than 50 dB(A). The temperatures are also not optimal. After an hour under full load with the tools FurMark and Prime, the Core i7-3820QM reached about 100 °C. The CPU Turbo was active even under these extreme conditions. The graphics cards on the other hand left us with mixed feelings. 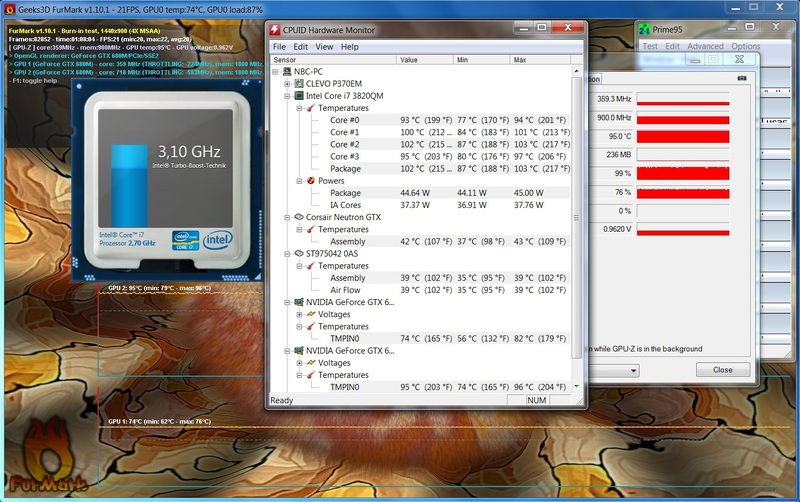 Despite the core throttling (360 instead of 720 MHz), one of the GTX 680M reached almost 95 °C. The other GPU stayed much cooler at 74 °C. 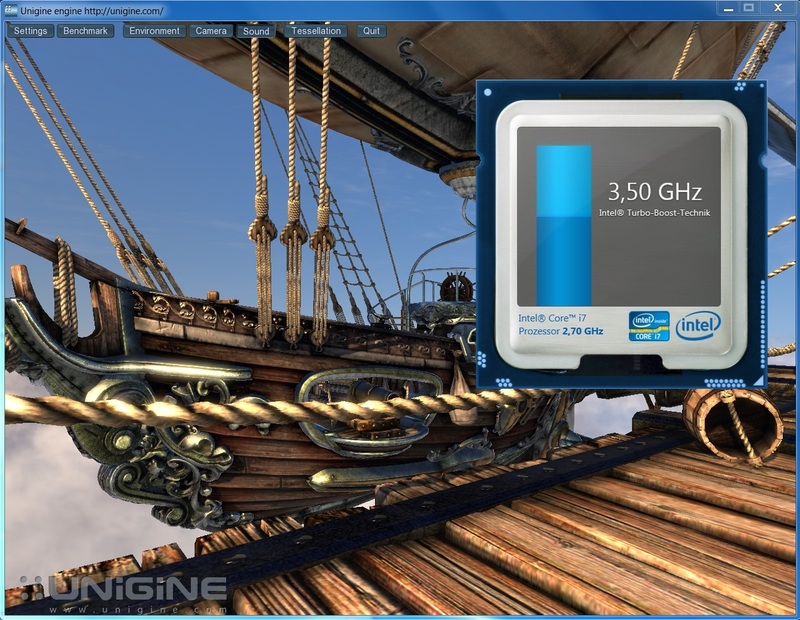 Under normal 3D programs such as the Unigine Heaven Benchmark the clock frequencies remained at the maximum. Over 90 °C is not to be expected in real (gaming) every day use. Regardless, the one kilogram heavier Alienware M18x R2 wins this category as well (stress test: up to 87 °C). The temperatures of the case surfaces are moderate. Almost 30 °C in idle state is properly low for a strong high-end notebook. 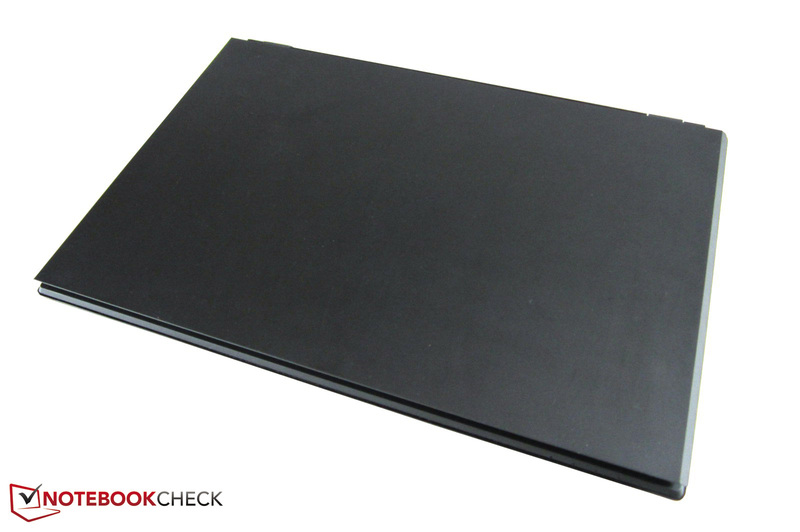 Under load the chassis reaches 36 °C, whereby the left palm rest is a bit on the higher side. (±) The average temperature for the upper side under maximal load is 36.5 °C / 98 F, compared to the average of 32.9 °C / 91 F for the devices in the class Gaming. (-) The average temperature of the palmrest area of similar devices was 28.7 °C / 83.7 F (-6.6 °C / -11.8 F). 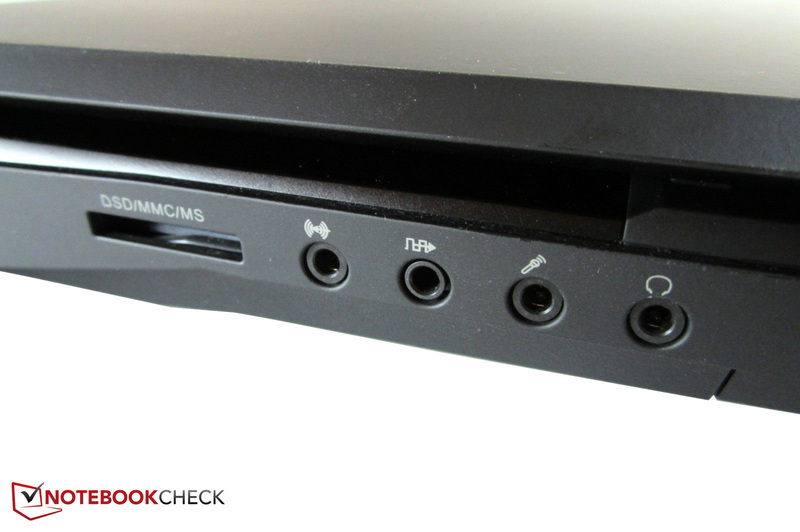 The P370EM is the first Clevo barebone in years that has a good sound. The manufacturer has installed two loudspeakers by Onkyo, which are driven by an X-Fi certified sound chip. 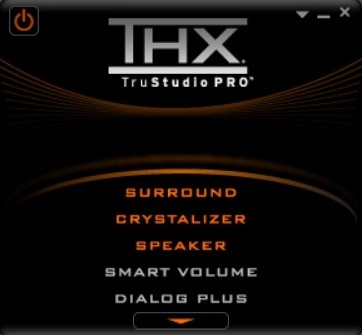 The THX software gives the notebook more fullness, clarity, and dynamics. 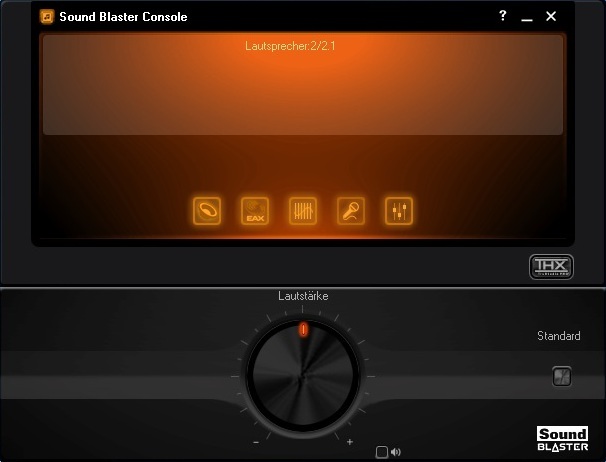 Even though the EAX effects subjectively worsen the sound quality, we were happy with the Sound Blaster console (right picture). The bass is fairly strong thanks to the integrated subwoofers. The higher maximum volume also deserves praise: The 2.1 system can fill even larger rooms. The barebone cannot achieve the title “Sound Reference” though. For a very good sound, the loudspeakers need to be a bit more precise. As a high-quality sound alternative we would recommend the MSI GT70. The high powered components need correspondingly higher energy. Since the SLI configuration prevents graphics switching, the idle consumption is not exactly low: 29-38 W, which can be significantly beaten by the cheaper XMG P702. 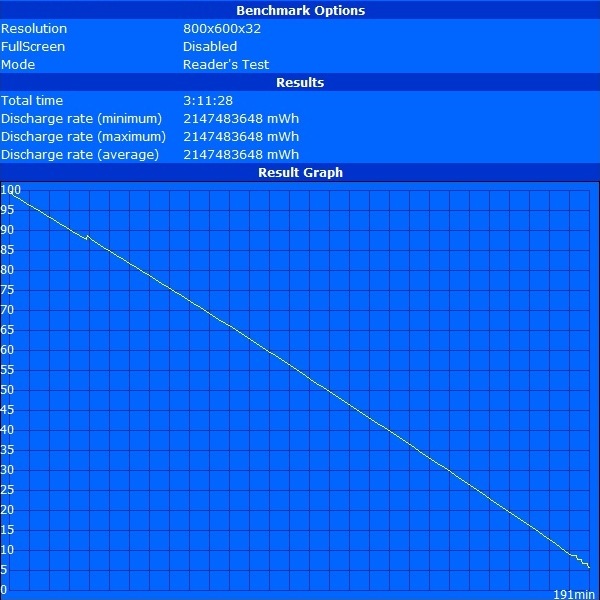 With a single GeForce GTX 675M (still 100 W TPD) the in-house brother draws only 14 to 29 W.
The bulky 300 W power supply of the XMG P722 is not really exhausted under load. Only in the stress test did the 17-inch notebook draw 256 W. In 3DMark 06 the value was 113 W. As the Alienware M18x R2 proves, the combination of 55 W CPU and Radeon HD 7970M CF consumes significantly more power. Despite the powerful 8-cell battery (89 Wh, 5900 mAh), the high-end notebook isn't a pretty picture off the socket. So the Reader's Test ran, even at the lowest brightness, only three hours. 2.5 hours of WLAN browsing (medium brightness) and two hours of DVD playback (maximum brightness) are also not amazing. A bit of a surprise was the Classic Test of the Battery Eater: 108 minutes are rare for a desktop replacement. Why is the score above average? Quite simple: The graphics cards are massively downclocked when using the battery. 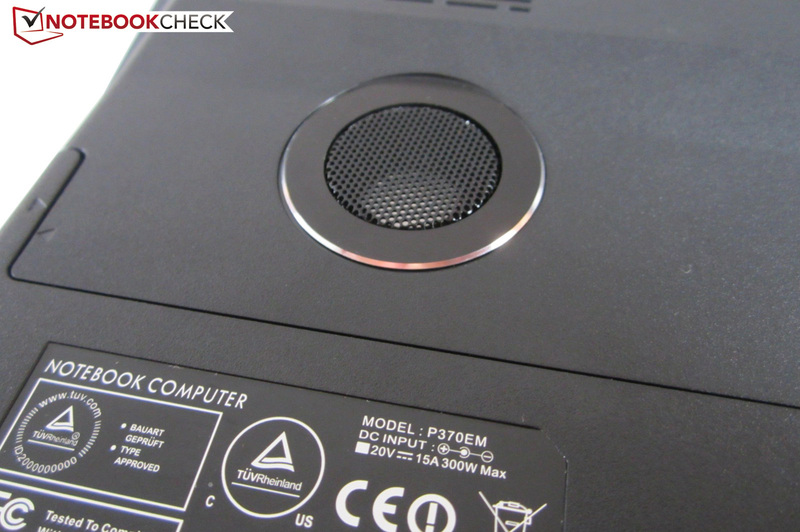 The reviewed configuration of the Alienware M18x R2 generally did not manage more than two hours. A great advantage of the Clevo device is the simple maintenance. 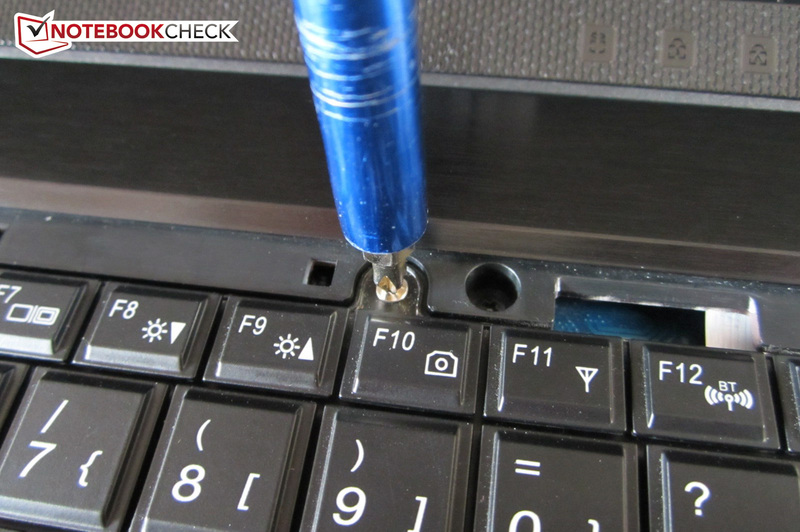 Nearly every component can be unscrewed and replaced (possible loss of warranty). 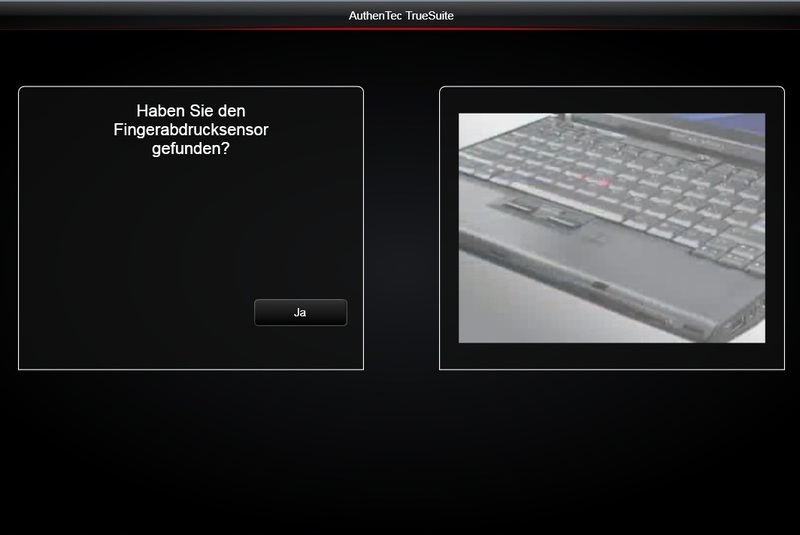 Most users however, can find the right hardware in the extensive configurator. It is also great that the good non-glare display is accompanied by a useful sound system. In addition there is the good connectivity (including 4 x USB 3.0), a high-quality backlit keyboard, and a clean Windows installation. The outstanding performance has already been discussed in detail. On the negative side are the sensitive and somewhat tacky touchpad as well as the average battery life and incredibly massive power supply. The emissions were also not good. Under load the components became quite hot. 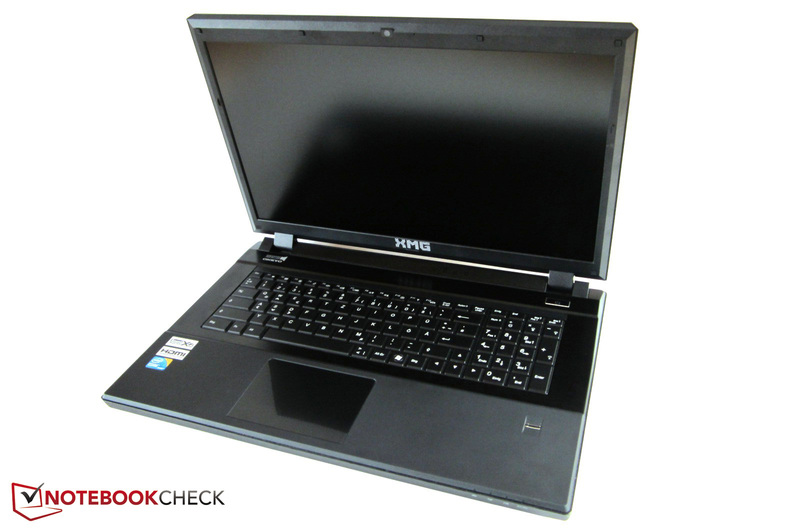 In terms of noise, one should not expect anything: Like most 17-inch gaming notebooks, it is not very quiet. 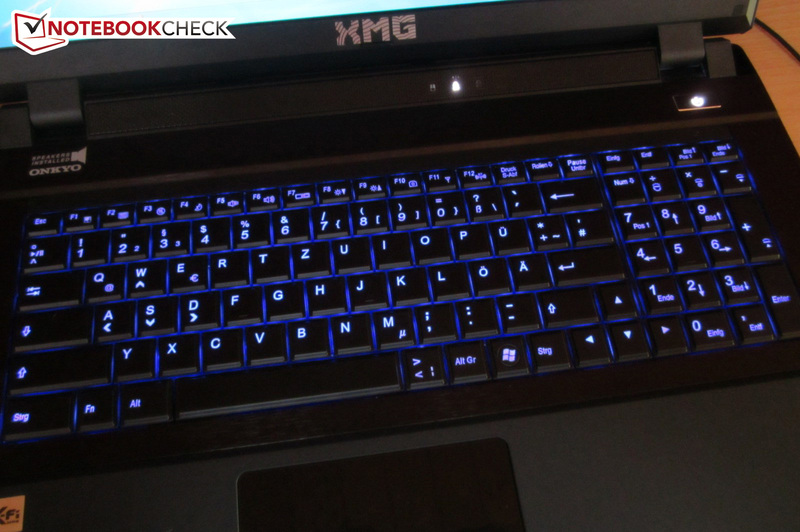 If you have taken a look at the Alienware M18x R2: The 18-inch notebook is better at the input devices, the connectivity, the emissions, and the workmanship. Disadvantages include the larger and heavier chassis, the highly reflective display, and the expensive upgrades. But whether it is Schenker or Alienware: A similarly powerful and well-equipped gaming PC can be built for half or even a third of the price. But this should hardly stop the notebook enthusiasts. From left to right: XMG P722 (300 W), XMG P502 (180 W) und XMG A502 (120 W). 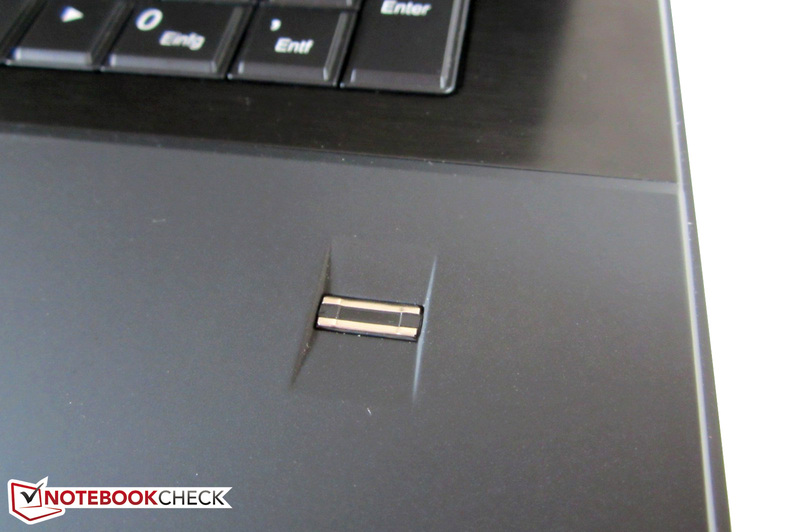 The notebook has a Creative X-Fi certification. 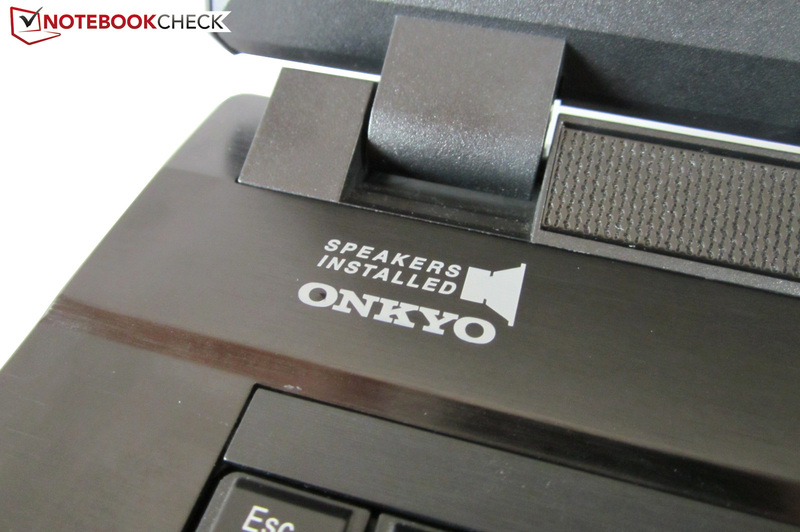 Onkyo is a Japanese sound expert. The keyboard scores with three lighting zones. A subwoofer increases the audio quality. The webcam is in the expected place. 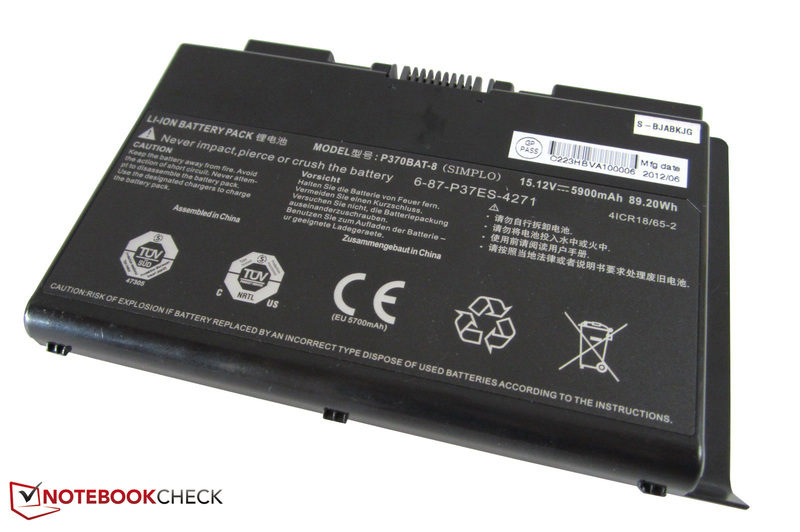 The 8-cell battery offers 89 Wh. The Neutron GTX is one of the fastest SSDs on the market. 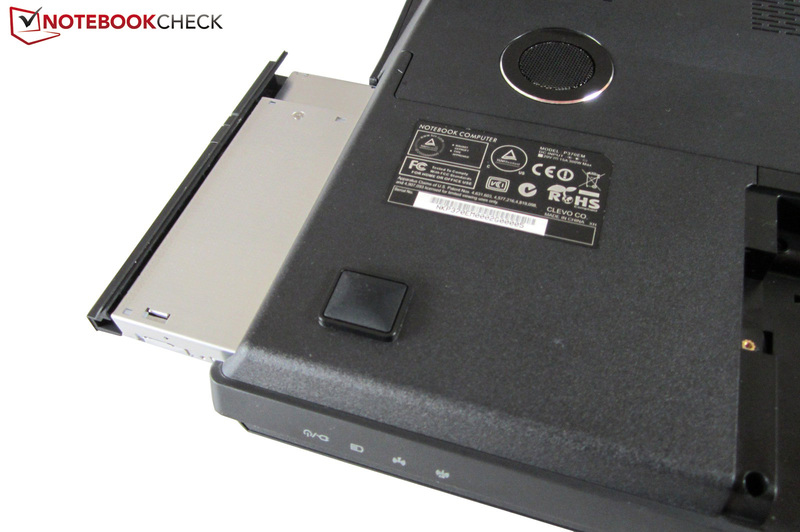 The optical drive is easy to remove (the screw is under the battery). The CPU (right) gives part of its heat off to the GPU fan (left). The high pressure point will please everyone. The arrow keys are adequately sized. 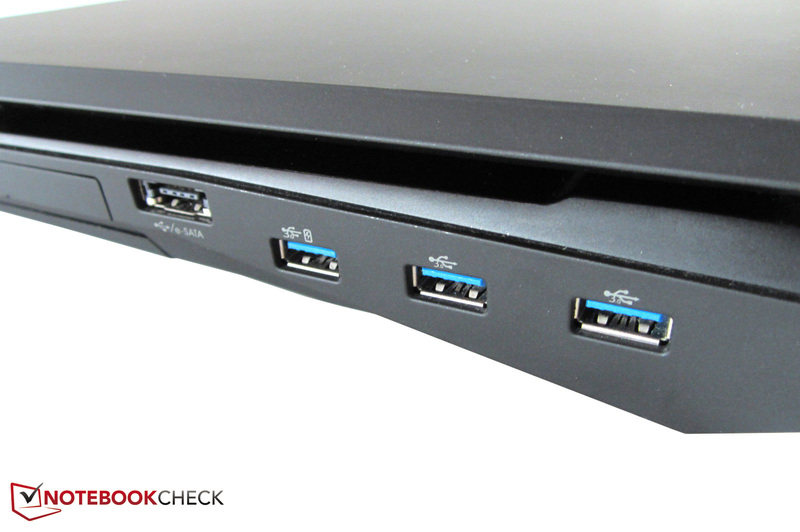 Next to the eSATA combo are three USB 3.0 ports. Blu-ray does not cost that much anymore. The audio jacks can drive a surround sound system. The AC jack is on the left side. Practical: An USB port on the back. The manufacturer has omitted an analog video output. The design is a bit unusual. The touchpad is not great. The finger print reader is a rarity. 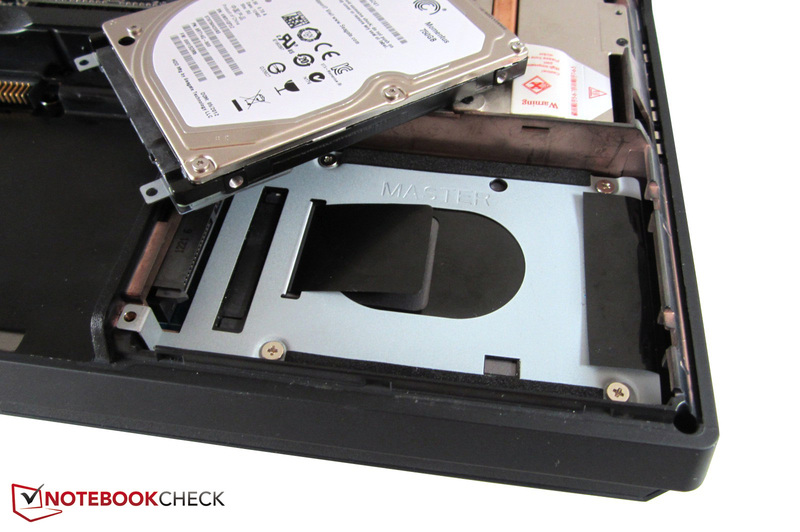 The secondary hard drive is below the main one. Various WLAN modules are offered. In contrast to the chassis, the display lid could have been more stable. The Full HD display looks great. The fans point towards the rear. 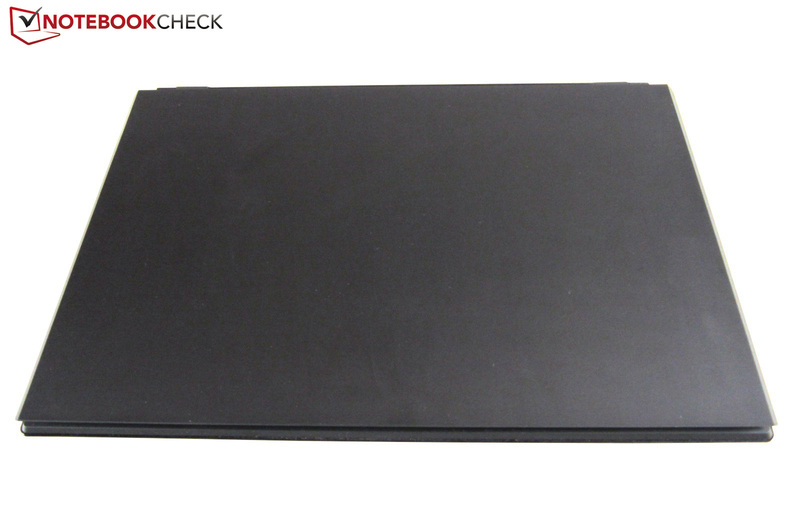 With two graphics cards and two hard drives, the notebook reaches about 4.3 kg. The notebook is more than five centimetres high. The touch pad is one of the few glossy elements. The battery sits in the middle area of the palm rest. Greasy hands quickly leave prints. As usual the manufacturer relies on dark colours. Full access to all the components. The matte version barely reflects. RAM slots 3 and 4 are under the keyboard. Fancy system memory by Corsair. The XMG P722 is equipped with powerful high-end GPUs. In addition to the two 2.5-inch slots, there is an mSATA slot as well. Such a massive cooling system is rare. The bottom covers are held by a few screws. When gaming, the surfaces become quite warm. The keyboard frame is made of aluminium. There is little to complain about the workmanship. The unspectacular lid is rubberised. The desktop replacement offers a guaranteed future. Above all a matte touchpad. Clevo has finally created a decent sound system. 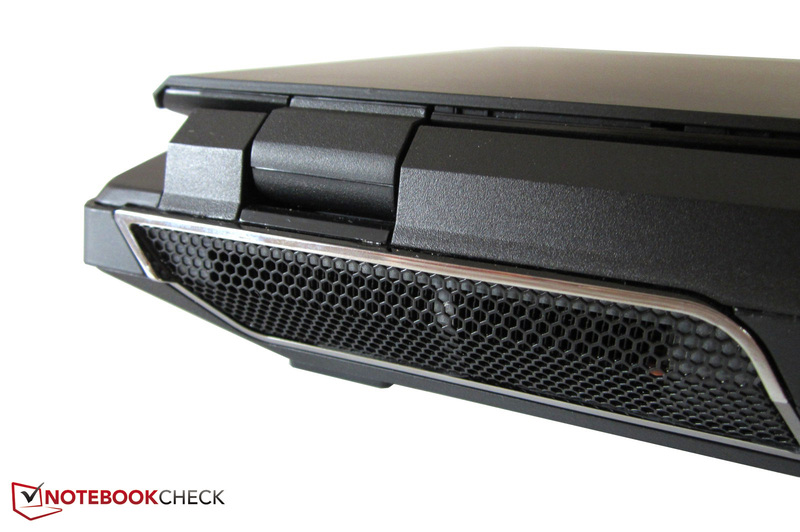 SLI or CrossFire notebooks such as the Alienware M18x R2.